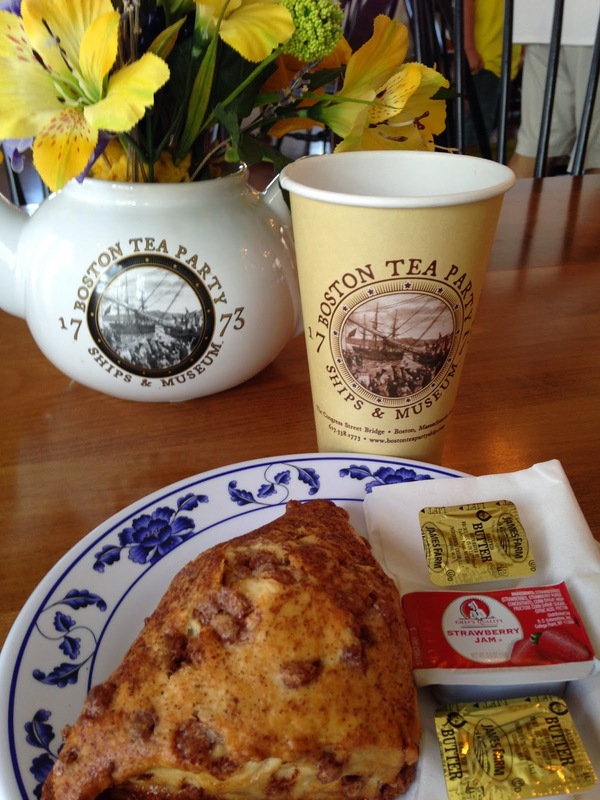 Savoring Boston, one cake, pie, and dainty at a time. Swan Song for the Bakery Babe...or is it? Visit my new blog at www.silverwebb.com! It has been three and a half deliriously delicious years as the Boston Bakery Babe, and I have enjoyed every bite. 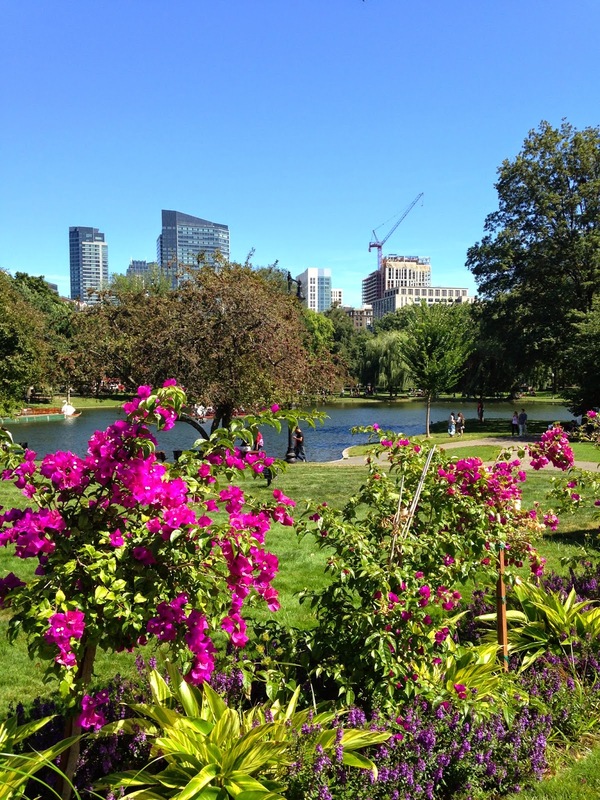 Savoring Boston one cake, pie, and dainty at a time has given me a taste of the city that I will always treasure. Thank you to the 53,000 readers who have visited me here in that time. I never expected that a site which began with my love of cupcakes and cream puffs would reach so many people, but I am so pleased you visited! 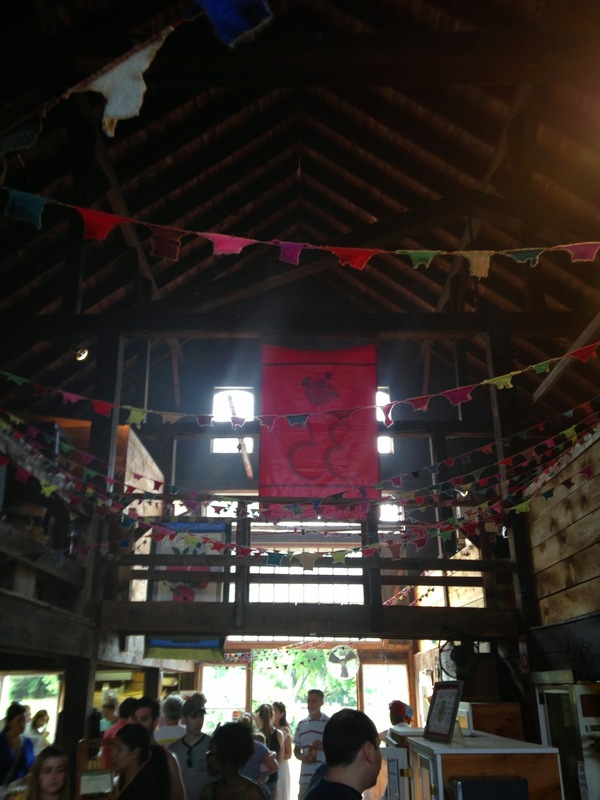 Le Salon Curieux de Silver Webb! 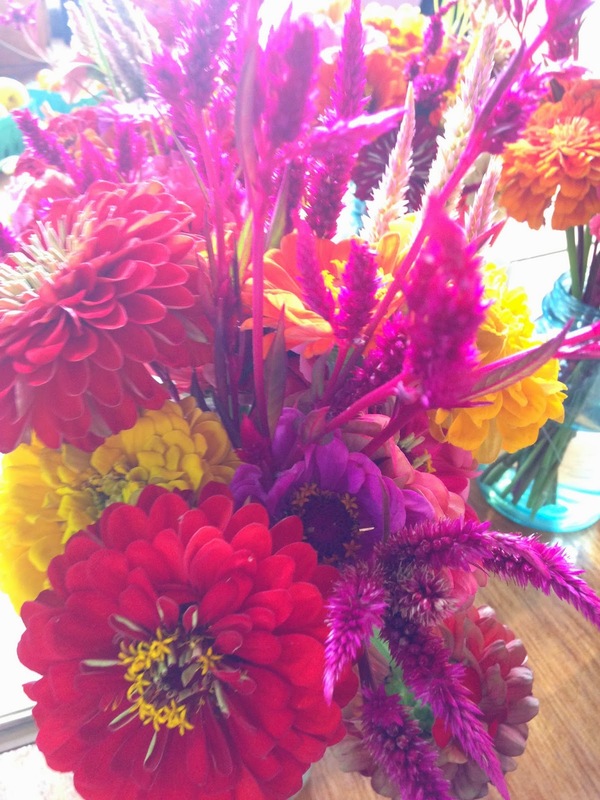 Please visit me there for further food adventures in California, paintings of fairies and mermaids, and so much more fun! 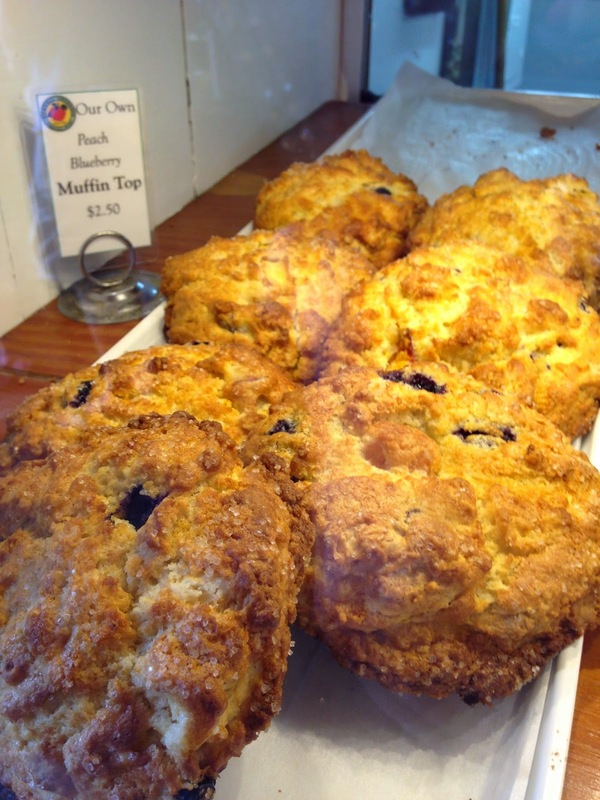 I will leave the Boston Bakery Babe site up, as a tasty trove of information about Boston, for anyone who wishes to read. But I will not be updating information on location, hours, etc. for bakeries, so please verify all of that before you set out for a visit. And let me say, Boston is so worth visiting. It is a city I truly love. 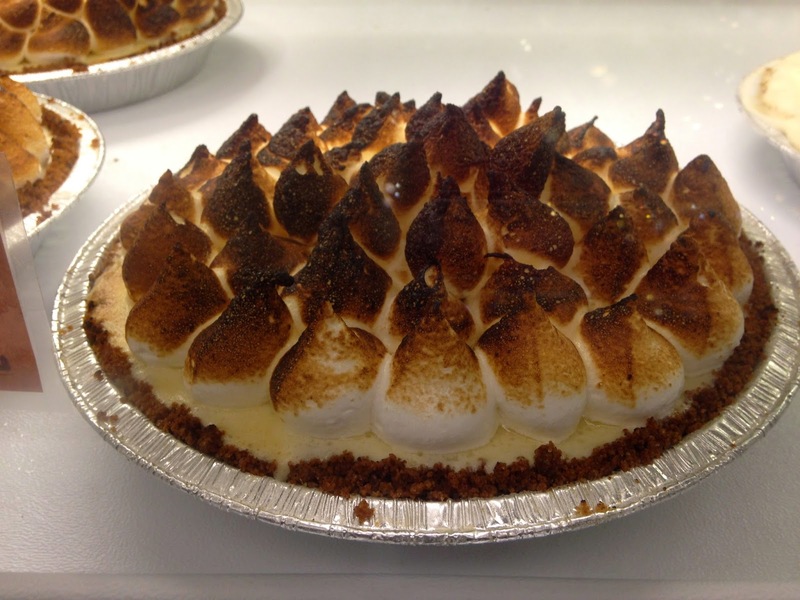 Rosebud Diner: At last, the pie gods are sated! 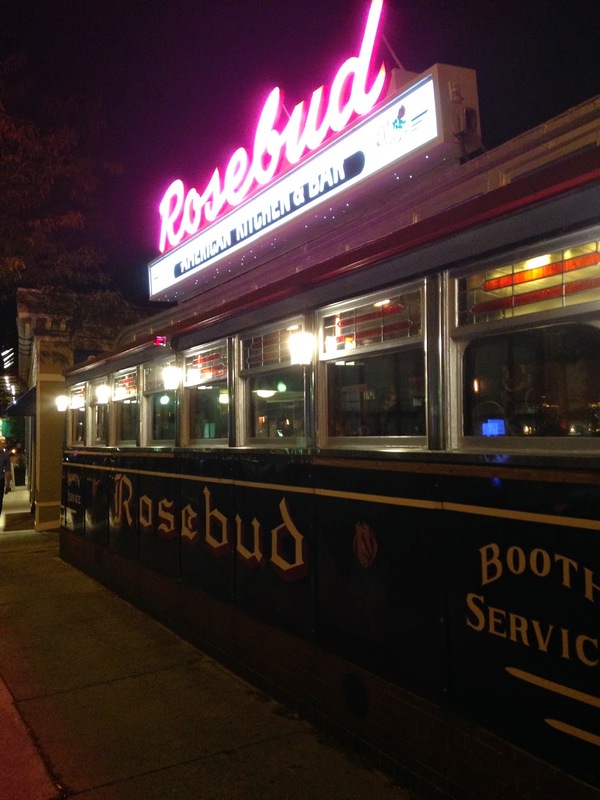 The Rosebud has been rebooted! The iconic diner car restaurant of Davis Square has been reopened to much fanfare. Although presently only dishing up dinner, it will soon be serving lunch and brunch with much aplomb. But why, you may ask, would the Bakery Babe be fiddling about with an upscale gastro diner with green leather-tufted bar stools, designer lighting, and no shortage of hipster patrons? The answer is simple. Pie. Regular readers of the Bakery Babe will know that my summer pie quest, although diligent, did not end in a particularly satisfying way. 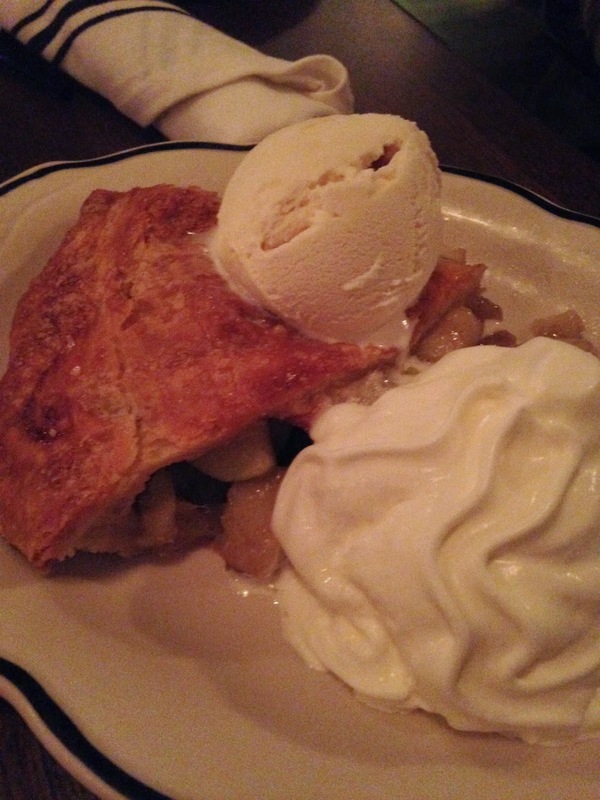 The pie gods were not sated, and I remained unable to recommend a place in Boston for truly good pie...until now. 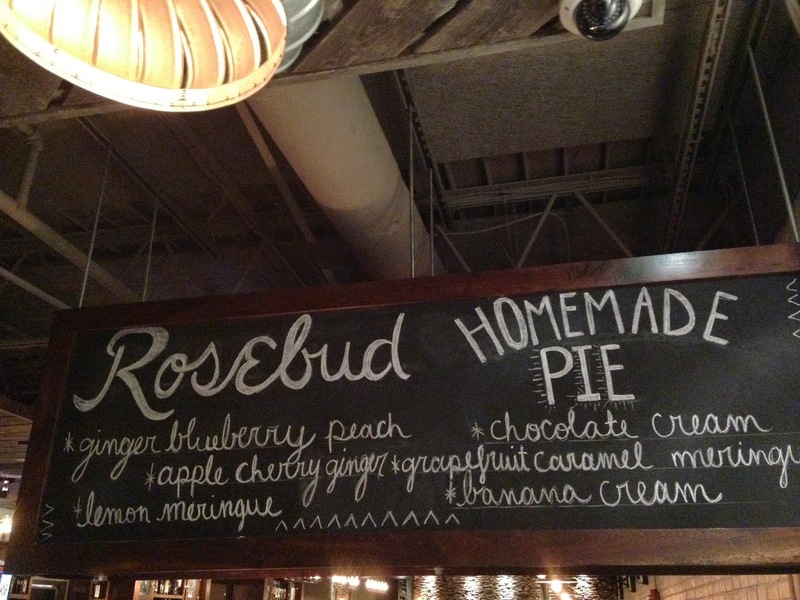 The Rosebud's dessert menu is largely comprised of pie. And although there are some tweaks to the classics, it is more-or-less the kind of pie that you imagine would be served at Grandma's kitchen table circa 1950. Having been invited by my foodie conspirator to have a pie tasting, I found myself hard pressed not to plant my face into billowing whipped cream and thick, honest-to-goodness chocolate pudding in the chocolate cream pie, with a crust that was soft, a little chewy, and very satisfying. I fear my face may have been speckled with chocolate in my enthusiastic devouring. But we had two more kinds to try, and I expected what you find at most restaurants and bakeries: the same crust filled with different toppings. But the Rosebud treats each of these desserts like its own little kingdom, and the crust for the apple cherry ginger pie had a sweet layer of caramelization on top that perfectly enclosed soft apples, tart cherries, and little gems of ginger. With a scoop of vanilla ice cream, I was verging quite close to sugar nirvana. And for the unusual and alluring grapefruit caramel meringue pie, I found a crumbly, sweet cookie crust housing a grapefruity custard, topped with cloud-like pillows of meringue...that truth be told did not taste like meringue...it tasted like a mountain of marshmallows that had been toasted to glorious perfection. How they are turning a profit by charging only $6 a slice for gourmet pie, I don't know, but I hope they keep it up! And also of note, cocktails are a specialty at the Rosebud. 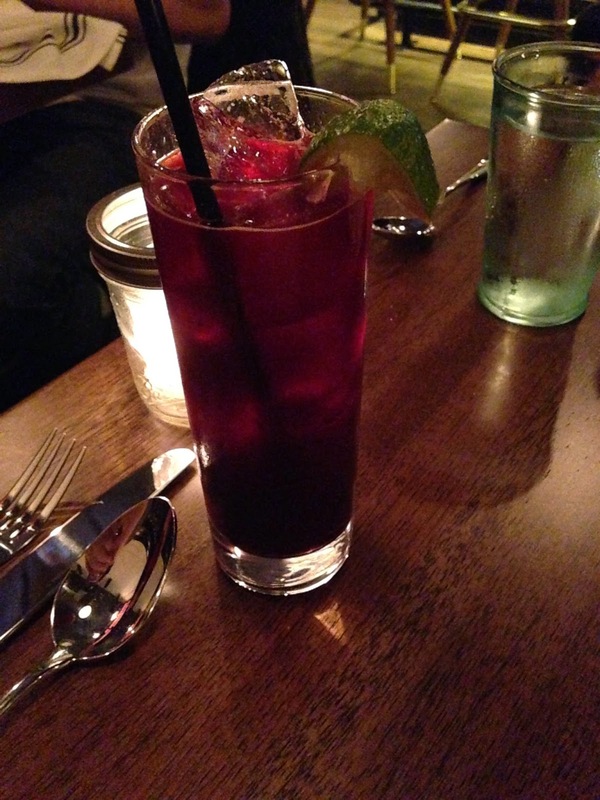 I can report that their mocktail Blueberry Collins is excellent. So, Boston, you have your answer at last. 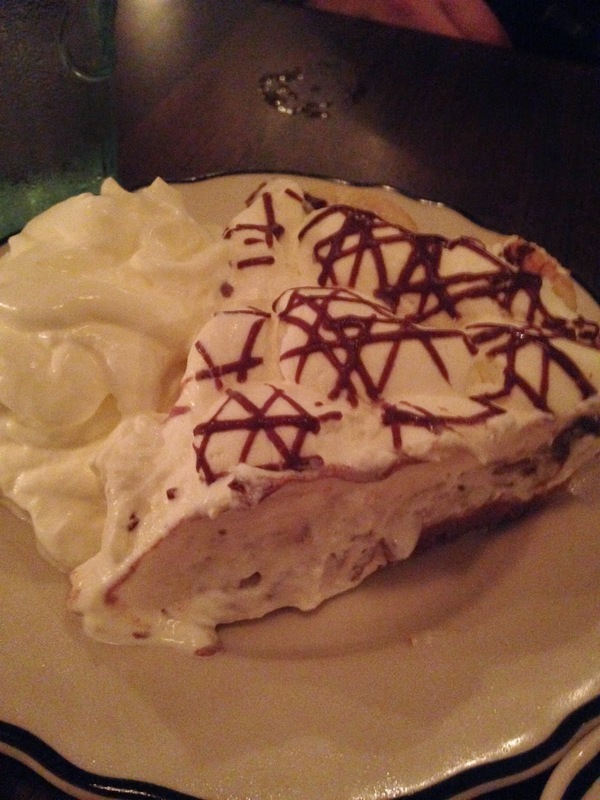 If you're in the mood for a heavenly pie jag, make the trek out to Davis Square and grab a seat at the Rosebud Diner. It's well worth the trip! 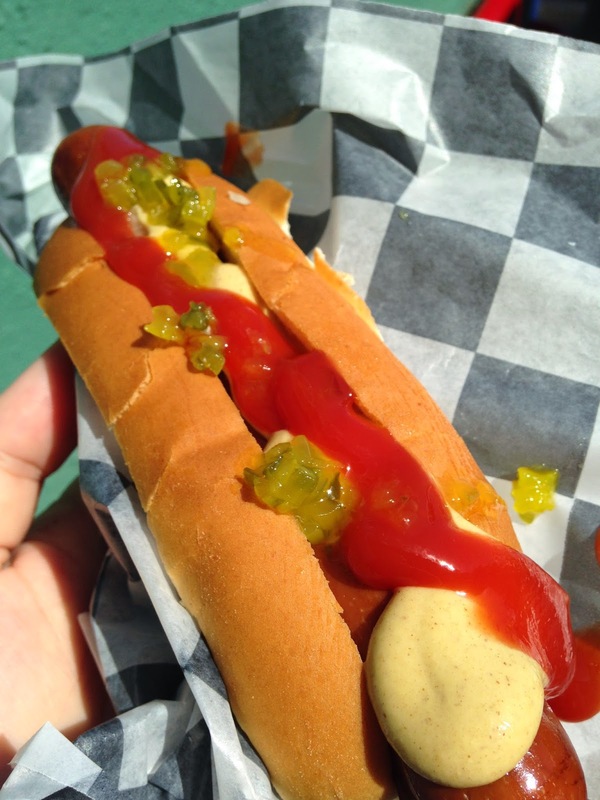 Fenway, America the Beautiful...and veggie dogs? Baseball mystifies me. My opinions on baseball are limited to critiquing the beards and bell-bottom pants that seem to be part of the modern baseball uniform. Am I the only one who misses those knickers that came to the knee, and clean-shaven guys looking snappy at bat? The Red Sox seem to have enough collective facial hair to weave a roof to cover Fenway. But no matter! 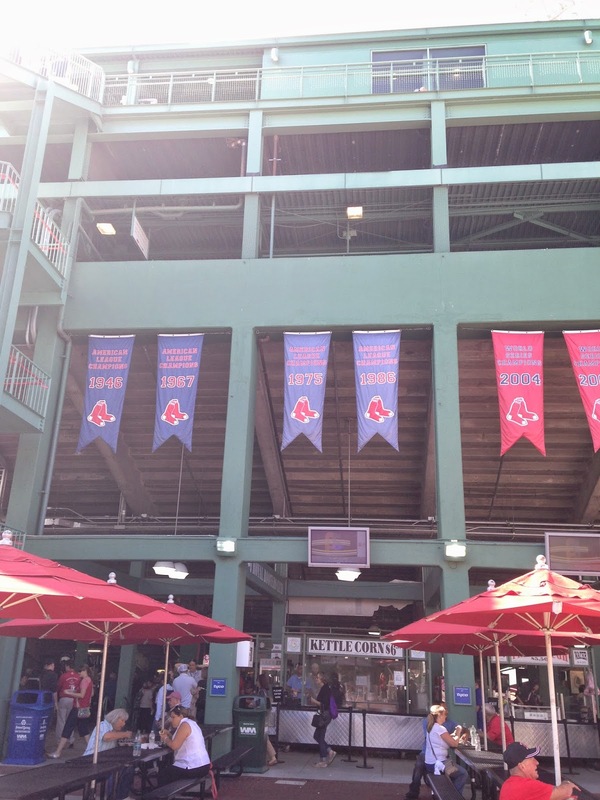 Suffice it to say that I did not expect my visit to Fenway to be life-changing. 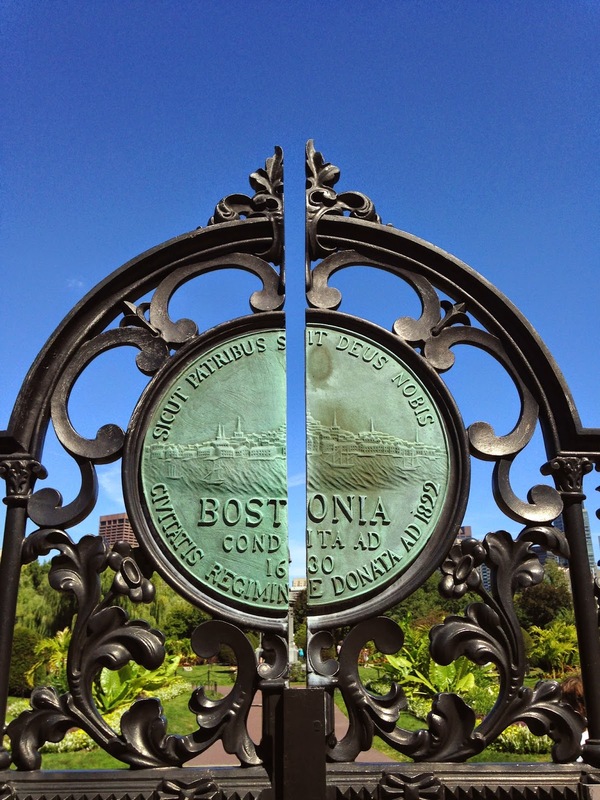 But I felt it was my duty as a Bostonian to at least investigate. 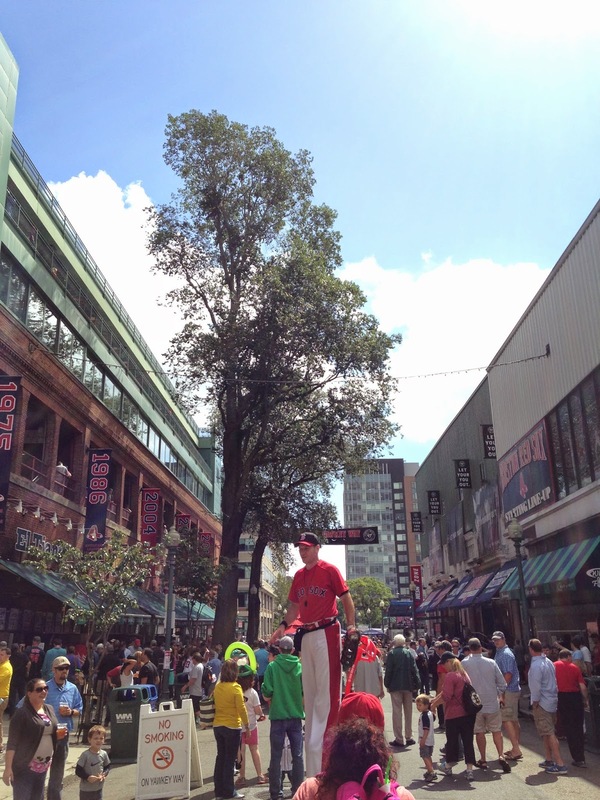 So, with my $8 ticket, off I went to Kenmore on the Green line, into the carnival that is Yawkey Way. 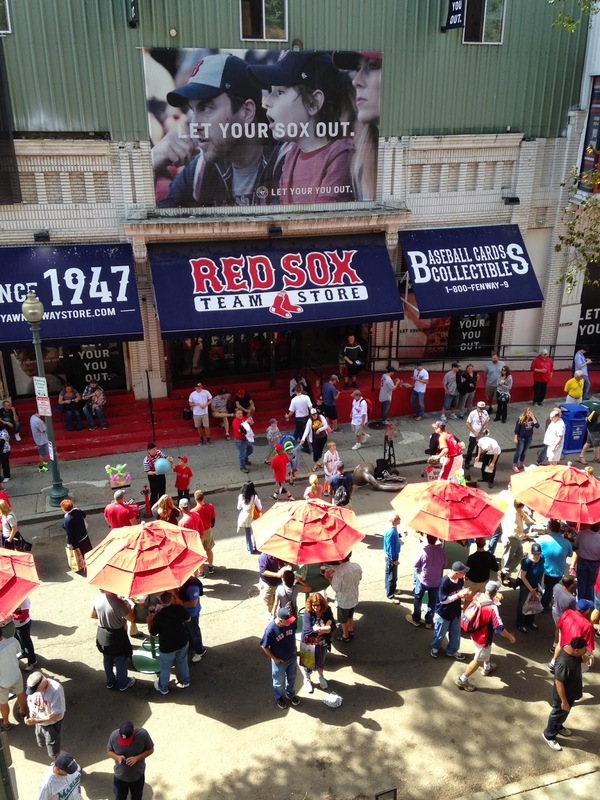 For those new to Fenway, Yawkey Way is a little street outside the main entrance to Fenway, wherein you will find concession stands, guys on stilts, brass bands, and stores with Red Sox goodies. But I was saving my stomach for the concession stands inside Fenway. You see, I'd been told that the crucial things to have at Fenway are peanuts, a beer, and a dog. 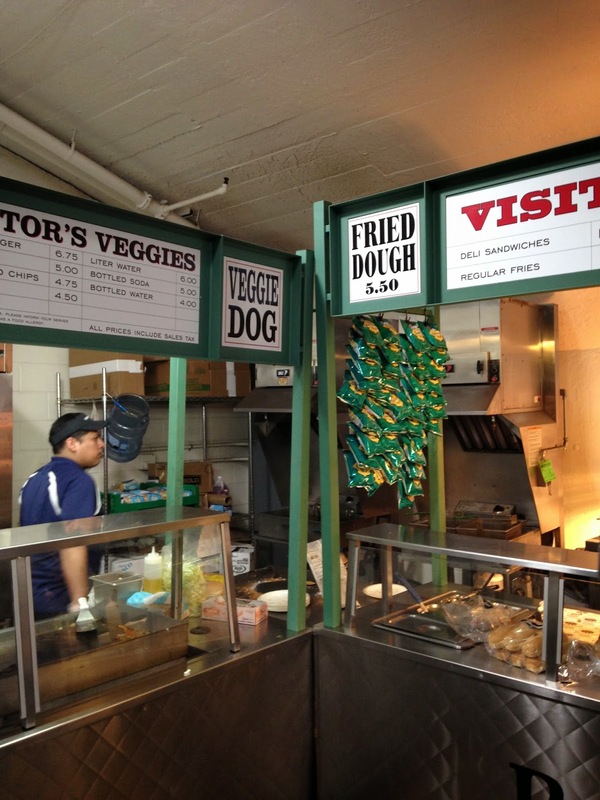 And since normal dogs aren't an option, I'd done a little research and found that one concession stand in the entirety of Fenway sells veggie dogs. It is hidden far off in the corner of the concession strip, almost as if it is hiding in embarrassment. And truth be told, I was expecting something that deserved shameful exile. But, I was pleasantly surprised. It was a fair sized dog, with a nice bun, and except for a slightly mushy interior, it was perfectly edible once it was loaded up with condiments. Had I been behaving, I would have followed expert advice and eaten this with a beer and a packet of peanuts. But I was sucked in elsewhere, and ended up with onion rings (tasty), a slice of pizza (nothing special), and an 8 oz cup of soda that cost $5. The prices at Fenway are ear bleeding. I paid $26 for lunch. 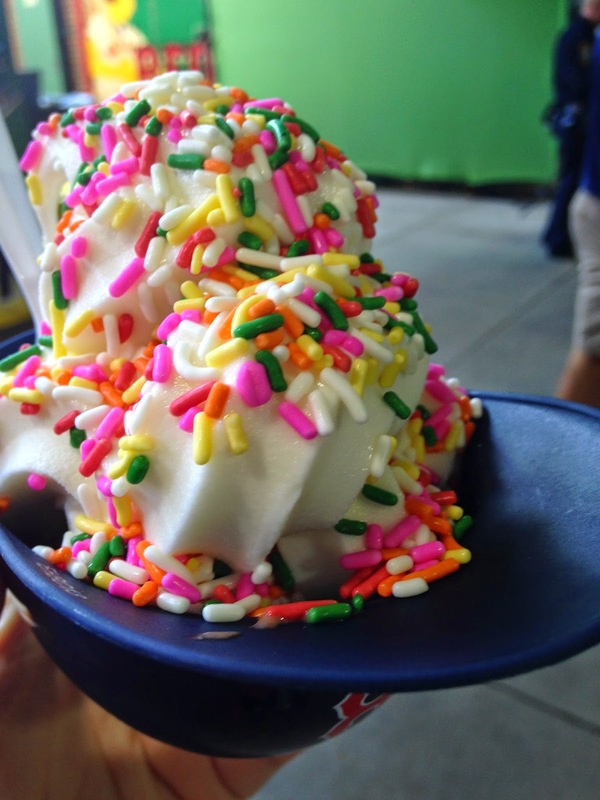 And another $6 for watery-tasting ice cream in a little plastic Red Sox hat. If were I basing my experience in Fenway on gastronomics, I would have come home a slightly sulky Babe. But the minute I walked into the arena, to thousands of excited Red Sox fans, I realized why this place has such a special place in Boston's heart. There is something about Fenway that feels old, in a good way. 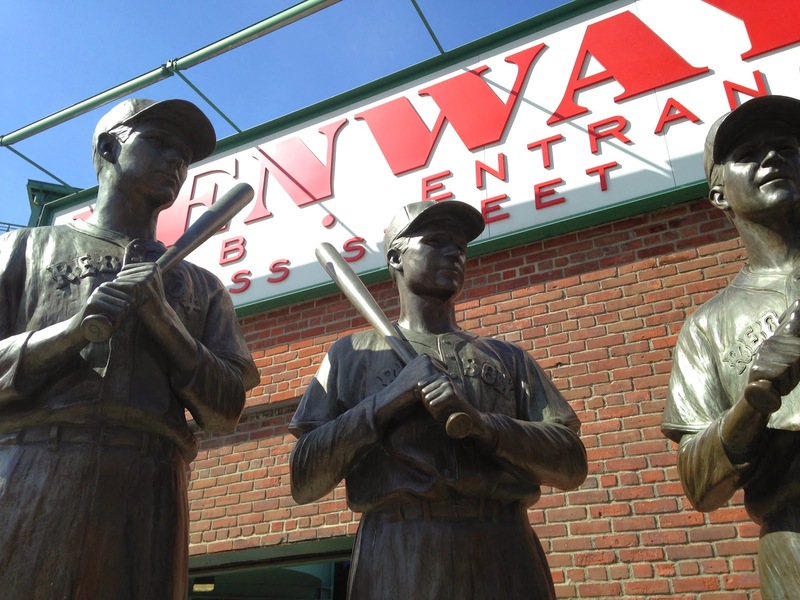 Sit in one of the wood seats, and it isn't too hard to imagine that it is 1912, the year Fenway opened. 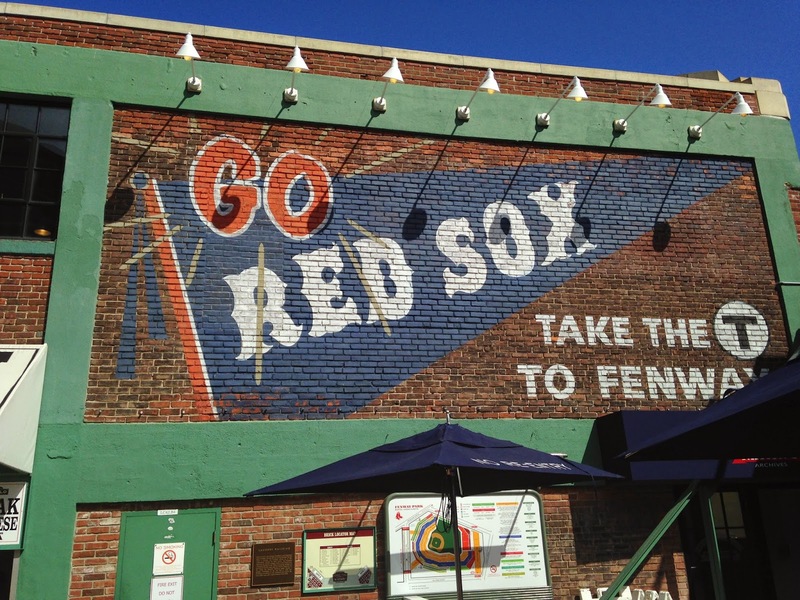 Add to that the sheer enthusiasm of Red Sox fans, and you have a really special experience. 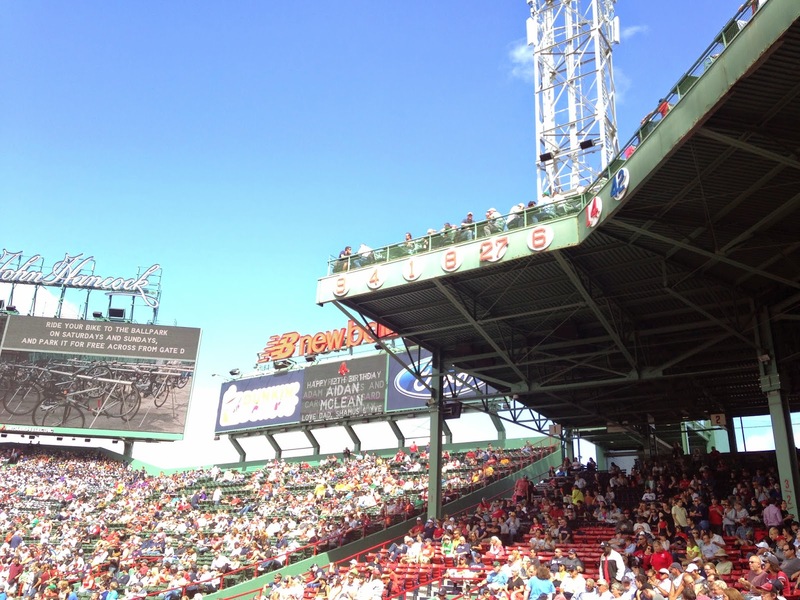 Even up in the worst bleacher seats, people were cheering and decked out in Red Sox hats. On the day I went, a veteran with prosthetic limbs threw the first pitch. And when the microphone died on the policeman singing the National Anthem, the entire stadium pitched in and helped him finish the song. 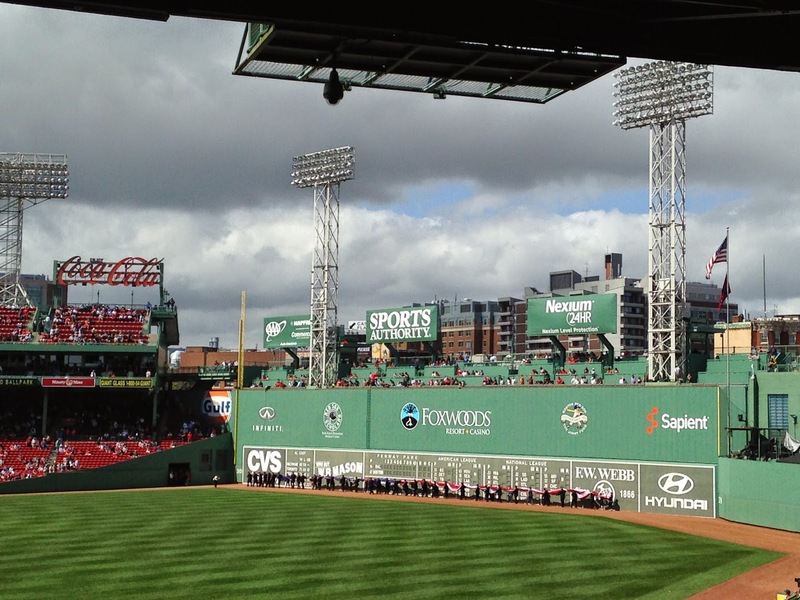 For those cynical about patriotism, an afternoon in Fenway will remind you of the better part of America. Sounds too corny, you say? Go to Fenway. See if you don't cry during the National Anthem. See if you don't come away feeling like you understand Boston a little better. Trust me, you will have a blast, even if you're a Yankees fan! 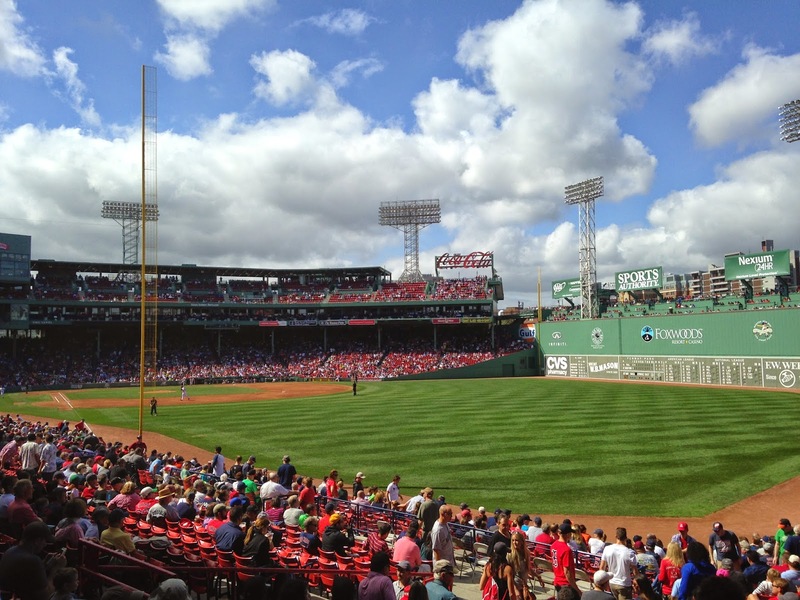 For those who don't want to go during a game, you can take a tour of Fenway on non-game days and learn about the history of the place. Occasionally, and for no defensible reason, I will reject a touristy activity out of hand, look askance at it, and keep walking with a grinchy pucker on my face. This usually occurs when a long line and a phalanx of crying kids in strollers are staring me down. And I'm embarrassed to admit that is the reason I haven't been on the swan boats before this. But today being a sunny, beautiful day, one of the last of summer, I decided now was the time to investigate. 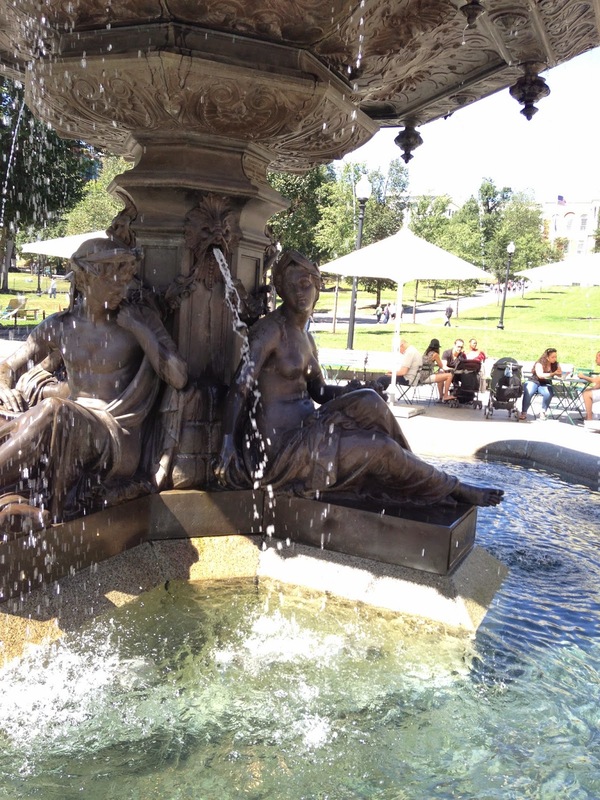 Walking through the commons, I stopped at my favorite fountain. And sure enough, waiting for me at the swan hut was the expected sea of tourists and baby strollers. 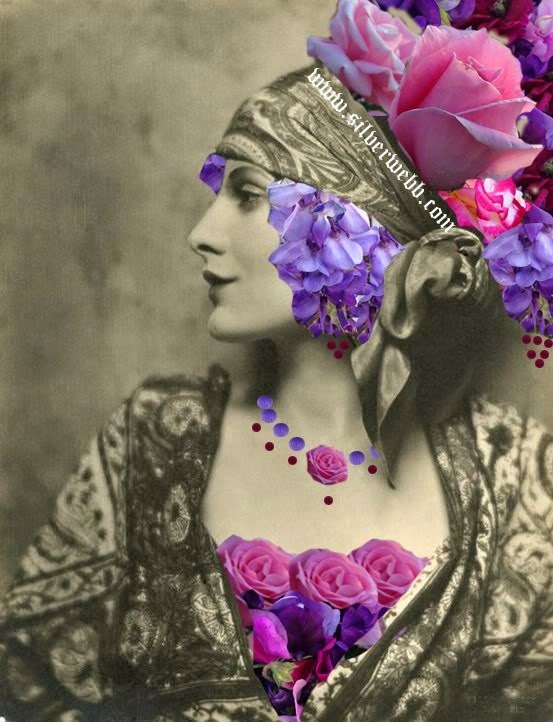 But I decided to ignore the impulse to flee, on the off chance that I'd been missing something wonderful for all these years. 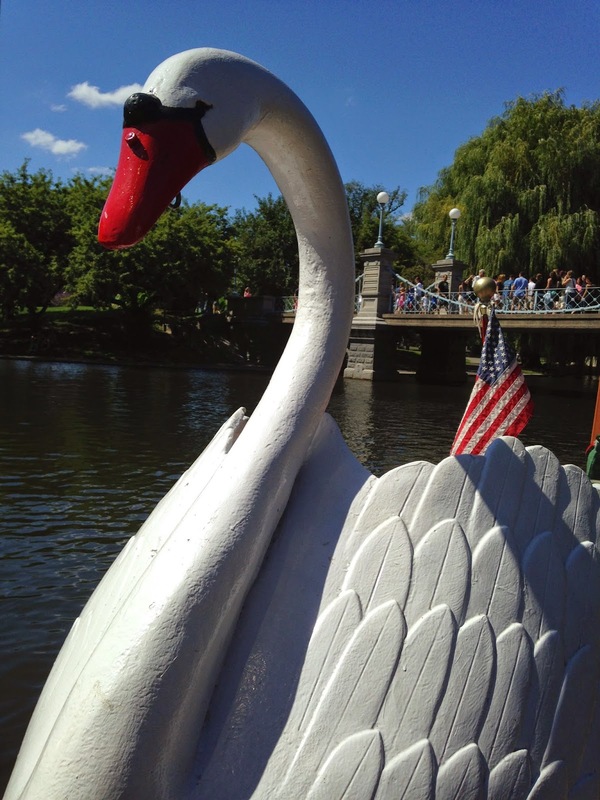 I waited in line for about twenty minutes, paid three dollars for my place on the swan boat, and found that as I sat on the old-fashioned wood bench, Mr. Swan peeking over my shoulder, a sense of peace and relaxation was imminent. 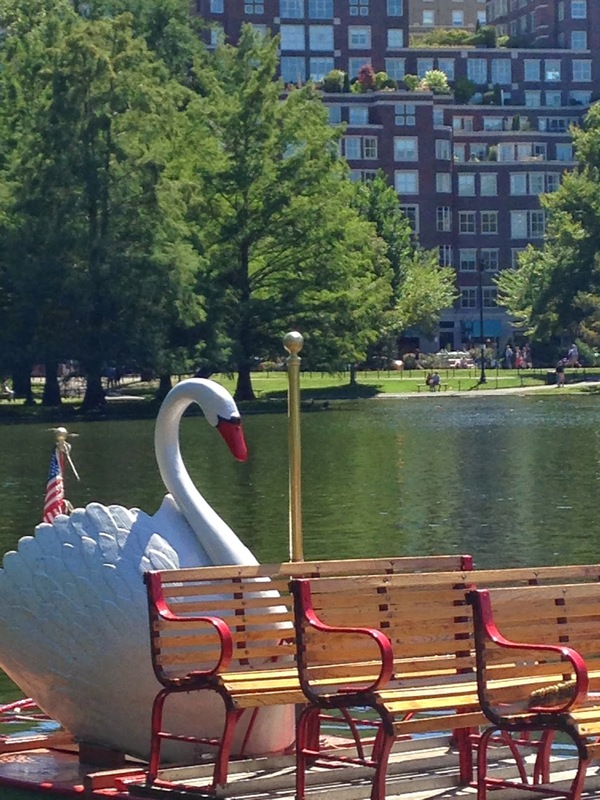 Perhaps it is the fact that the swan boats do not have motors; they are powered by one person pedaling at the rear of the boat. 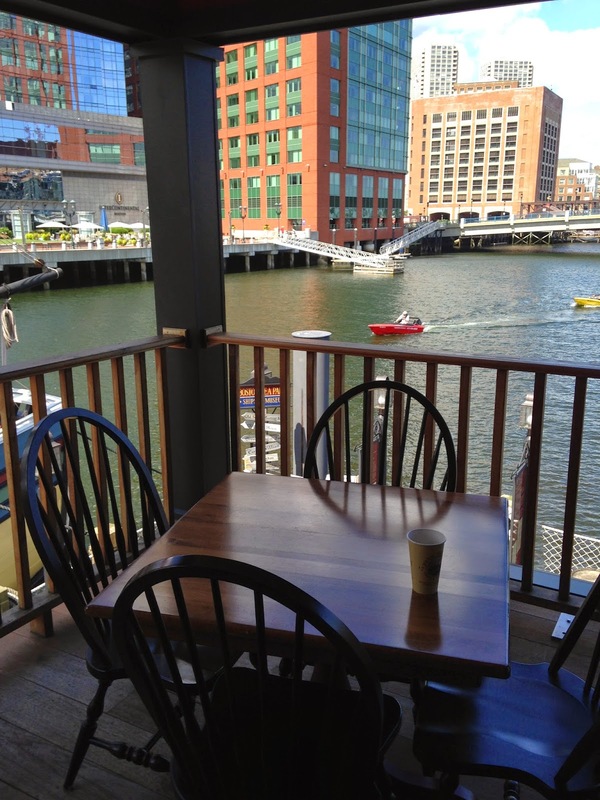 The effect is quiet floating around a shallow pond that affords lovely views of water, trees, and the Boston skyline beyond that. You will float by a myriad of ducks, including a little island where they roost. As I began to actually relax with the sparkly water and the blue sky and the sensation of having nothing much to do except watch the gardens go by, I wished that 1. I had an icy beverage in my hand. and 2. that I'd done this years ago. The swan boats really do have a unique feel of being longtime residents of the gardens, and having been there for 130 years, they count as tradition. 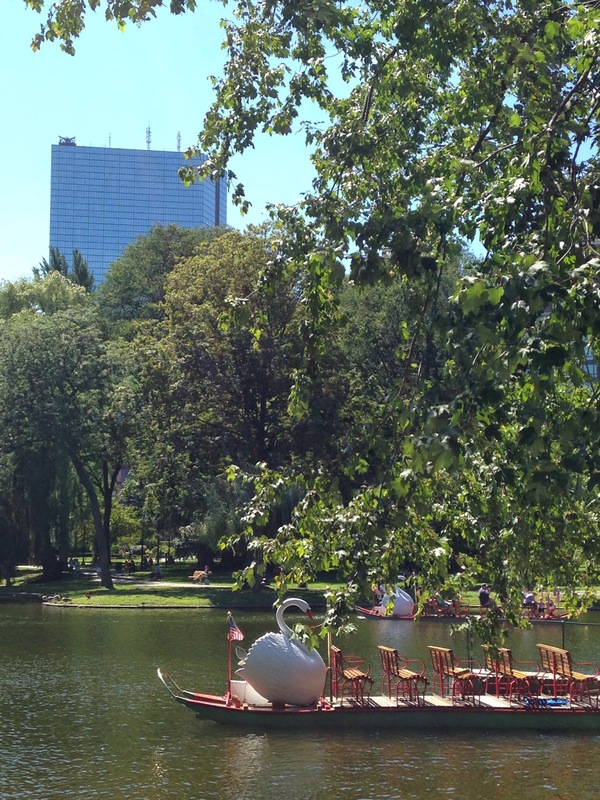 As long as you are spry enough on your feet to walk from the pier onto the boat, and have three dollars to spare, I highly recommend the swan boats. 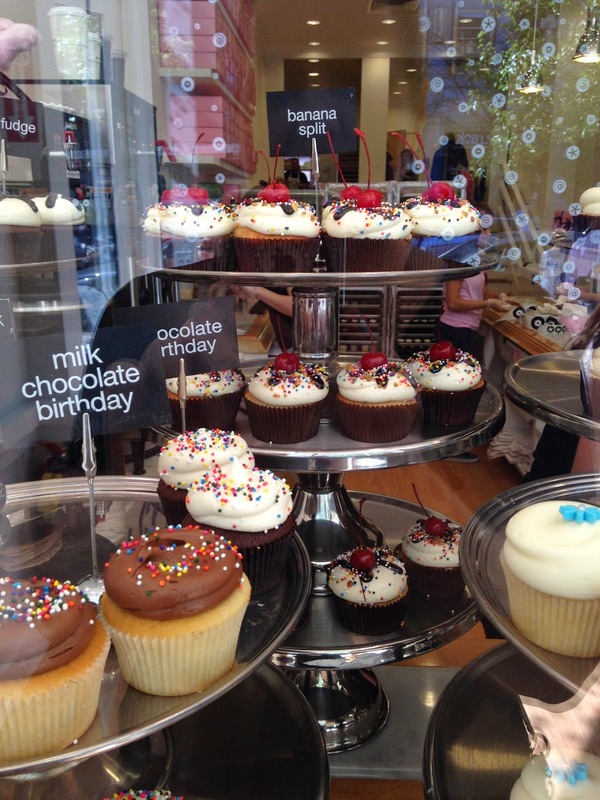 Having had my happy Boston sight-seeing moment, I headed down Newbury Street, stopping in oh-so-briefly for a mind-blowing banana split cupcake at Georgetown Cupcakes. But I saved enough room for coffee. 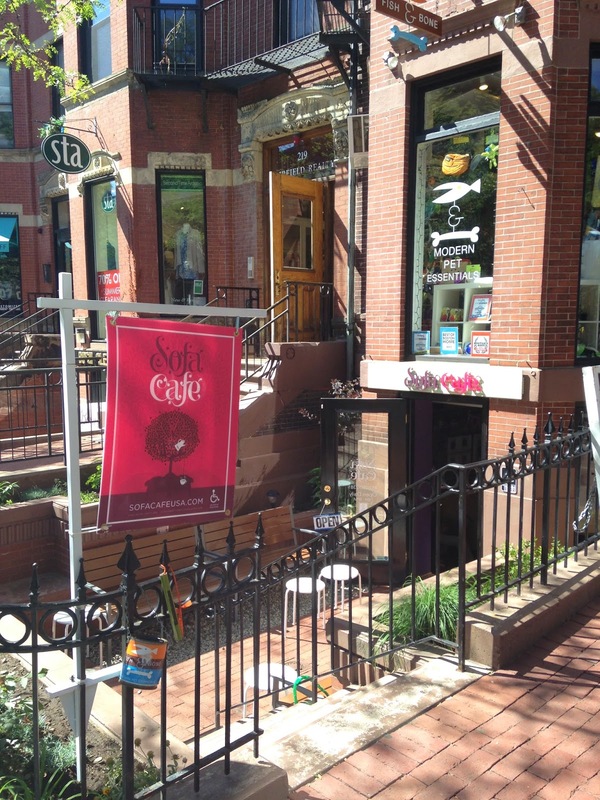 Because Sofa Cafe has opened on Newbury, and I'd heard that their coffee is a religious experience. 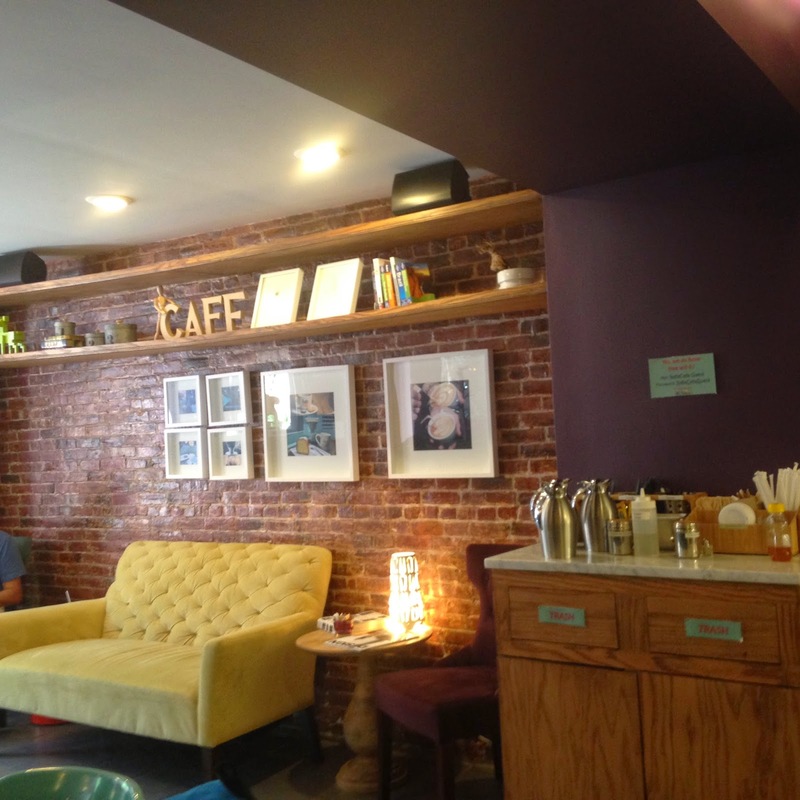 This little subterranean cafe is the flagship American version of a cafe that has done really well in Brazil. 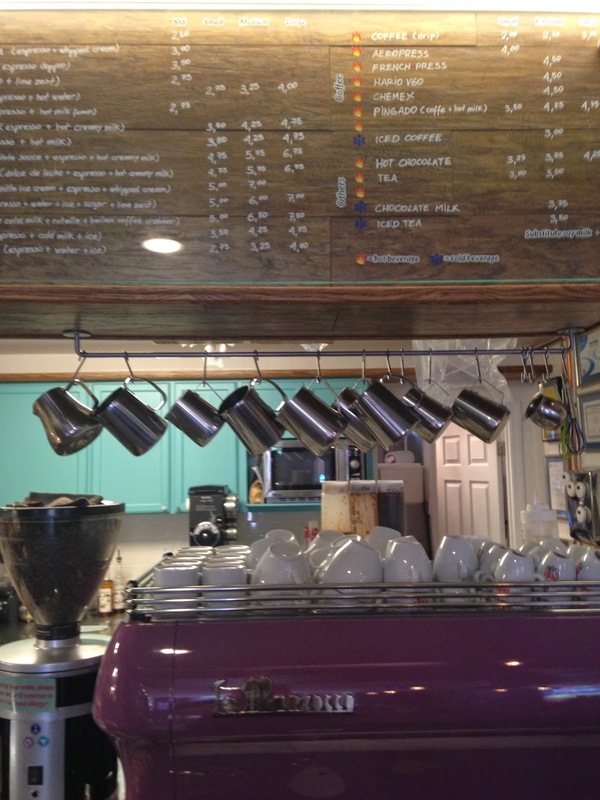 There is a sofa, pretty purple walls, and a retro spaceship of coffee making at the counter. 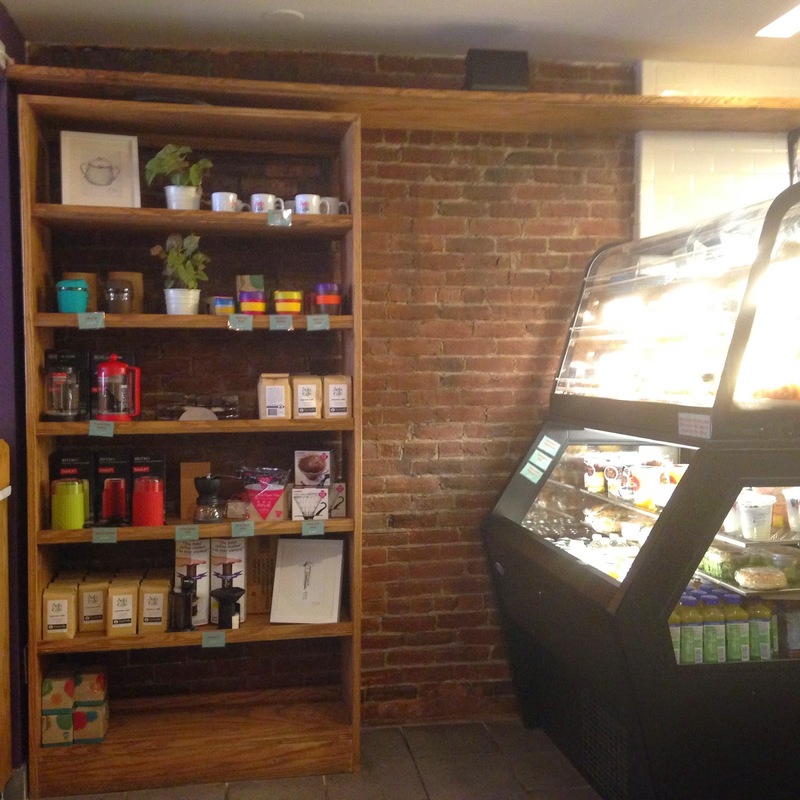 They have drinks like the Cult, comprised of espresso, milk, Nutella, and baileys creamer, or the Ventura, which is an iced coffee with a twist of lime. 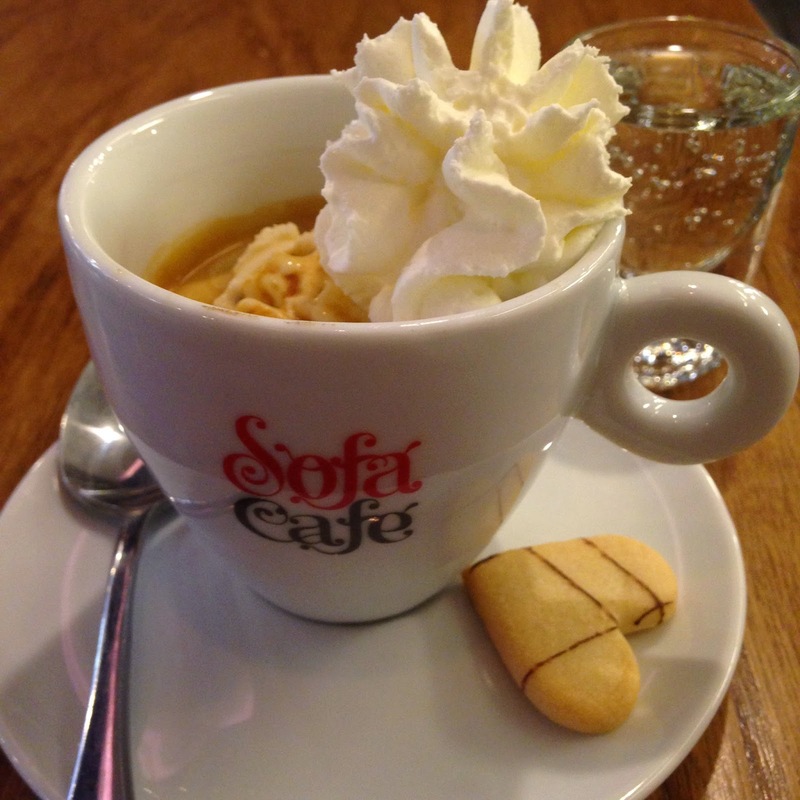 But I settled on the affogato, a scoop of ice cream (vanilla or chocolate) covered with a shot of espresso, topped with whipped cream. It was made with care by the barista, accompanied by a little heart cookie and a small shot glass of bubbly water to wash it all down with. It was one of those embarrassing moments when I find myself making little lip-smacking noises in public. The ice cream melts into the strong espresso, creating a foamy cup of delish...and with the whipped cream and cookie, it felt like I'd ordered a gourmet dessert rather than a drink. I'll grant you, this could easily have gone wrong if it wasn't done with care and good ingredients. But trust me, you want one of these for your afternoon coffee break. 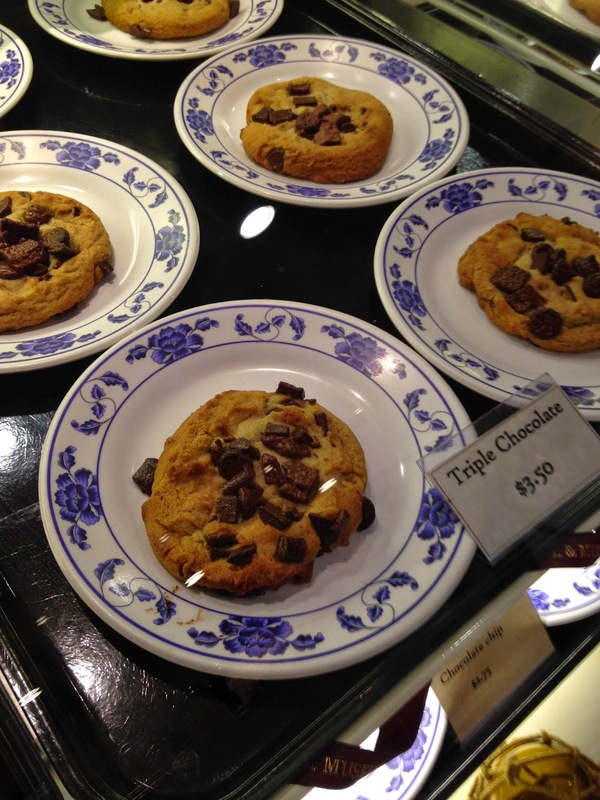 The display case of edibles was modest, and is stocked by the Danish Pastry House. As far as I'm concerned, it's the beverages that should take center stage here. Note: The swan boats are generally very stable, but I noticed that as we disembarked, it got a little wobbly from everyone standing up at once. If you're bringing small kids, make sure you hold hands for that part. It should be stated straight away that I am not adverse to tourist kitsch. 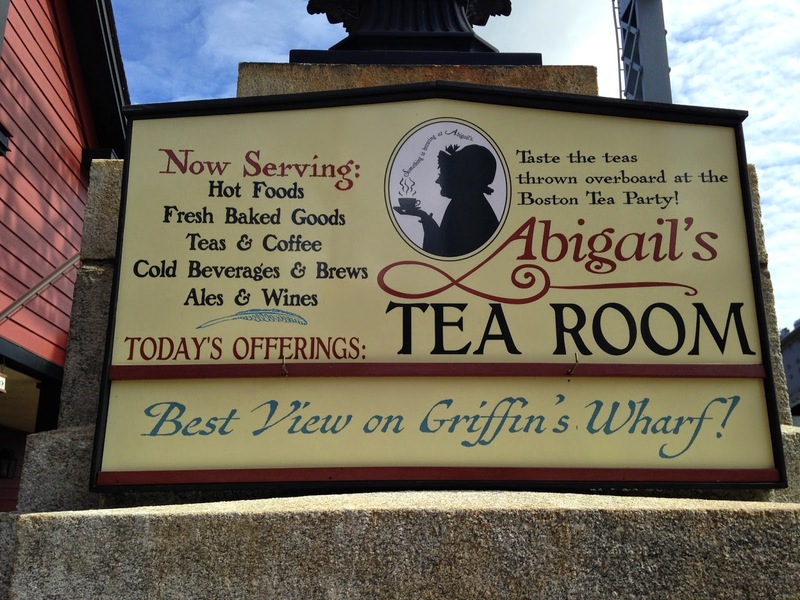 But I will admit that as I took the T to South Station and made the short walk to the Boston Tea Party Museum, I knew I had 80 percent odds that the baked goods from the Abigail Adams Tea Room were going to be a disaster. It rarely occurs that touristy places offer up good eats. 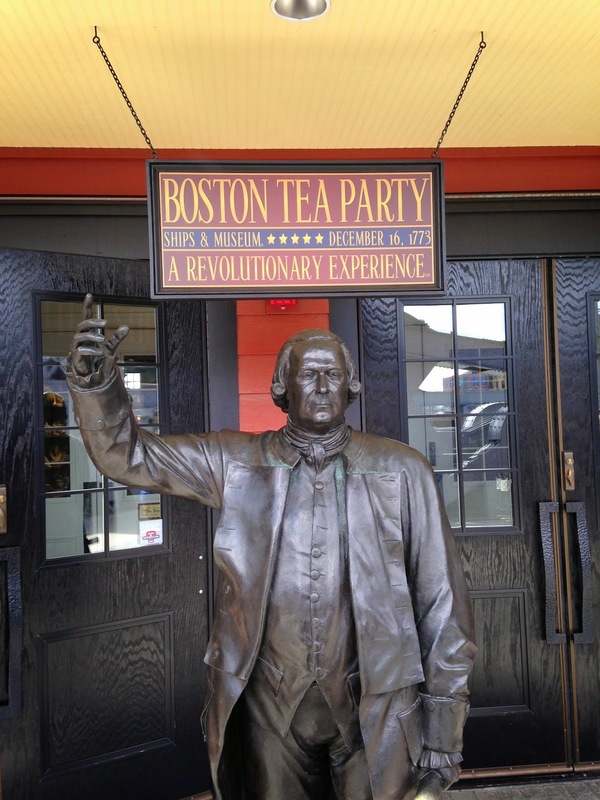 But believe it or not, when searching for tea rooms in Boston, this is the only one I could find. So in I went to the museum, which is located on the Congress Street bridge. The first thing I noticed is that everyone who works here, even the people at the cash register, are obliged to go about their business in costumes, and say "HUZZAH!" after nearly every sentence. You can even buy glasses with "HUZZAH!" written on them. This is the moment where, as a former historian, I knew I could either start twitching or roll with it. I chose the latter. And guess what? I had a great time! 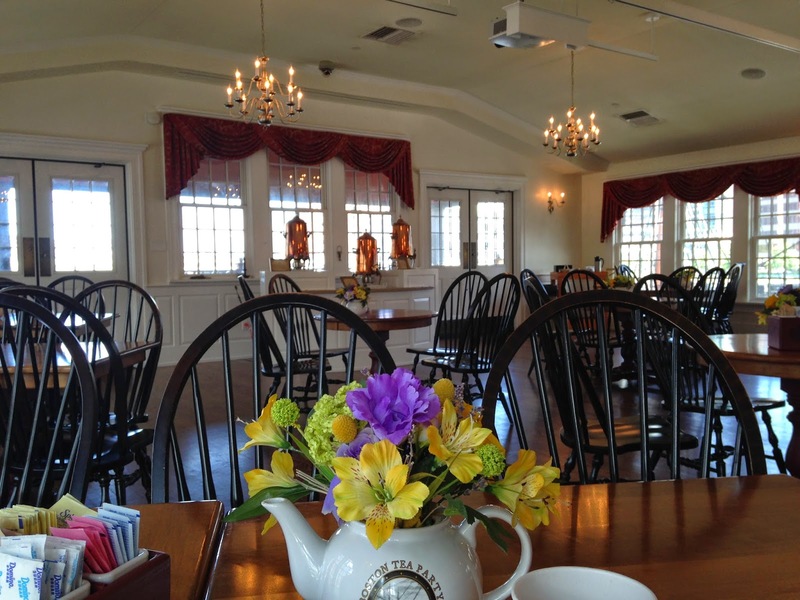 The tea room itself is quite large and pretty, with hardwood floors, chandeliers, and big windows that look out directly onto the ships that comprise the museum. 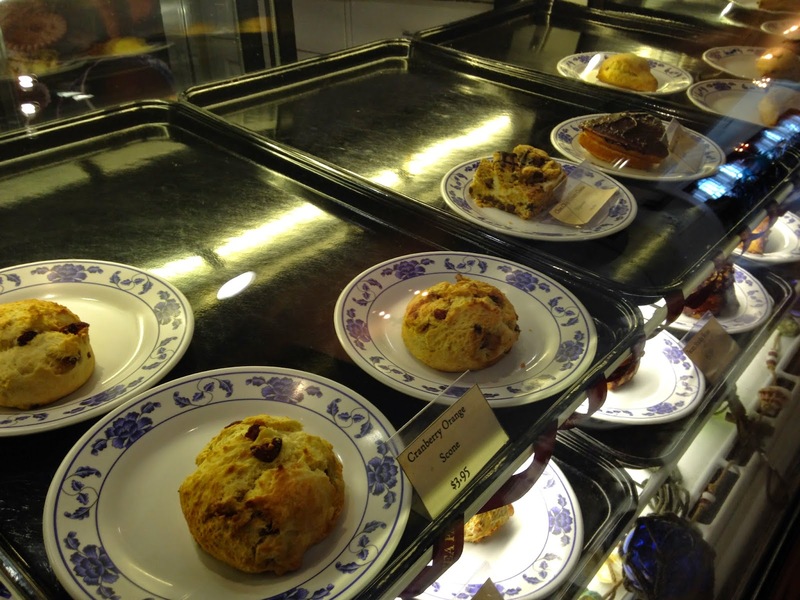 The small selection of baked goods are presented cafeteria style. In looking over the prices ($3.50 for a cookie, $4 for a scone) I bumped up my odds to 95% that I was about to be disappointed in the taste department. 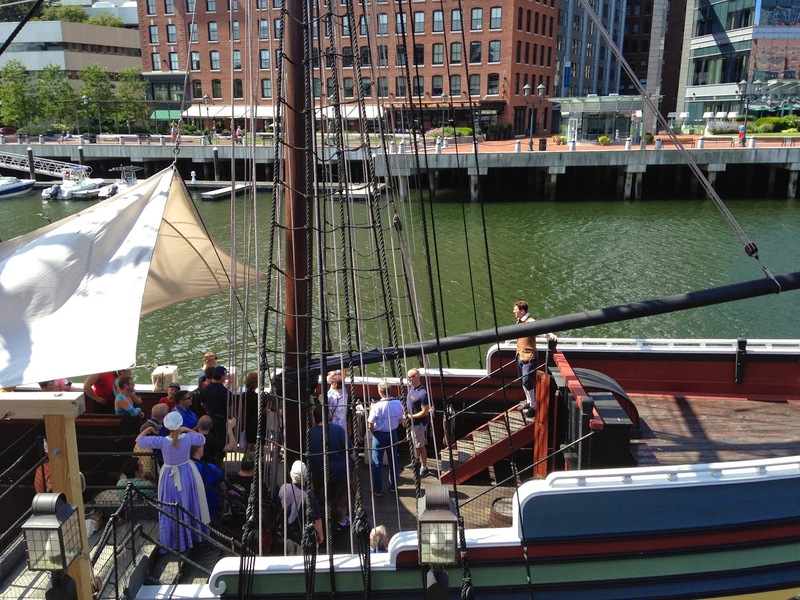 From what I could see of the antics down on the tea ship (actors give a speech and then visitors can toss "tea" over the side of the ship), this is the kind of "museum" where kids will have a blast. 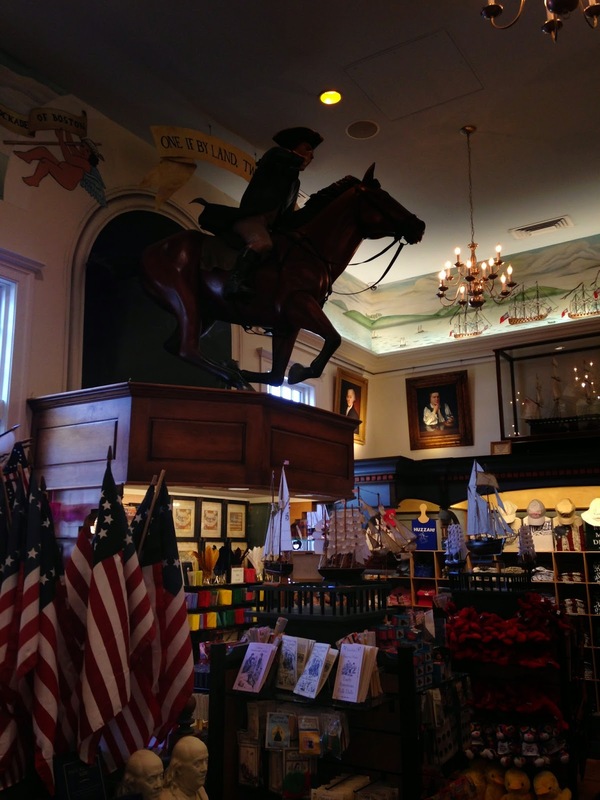 And the gift shop is actually the nicest souvenir shop I've seen in Boston. 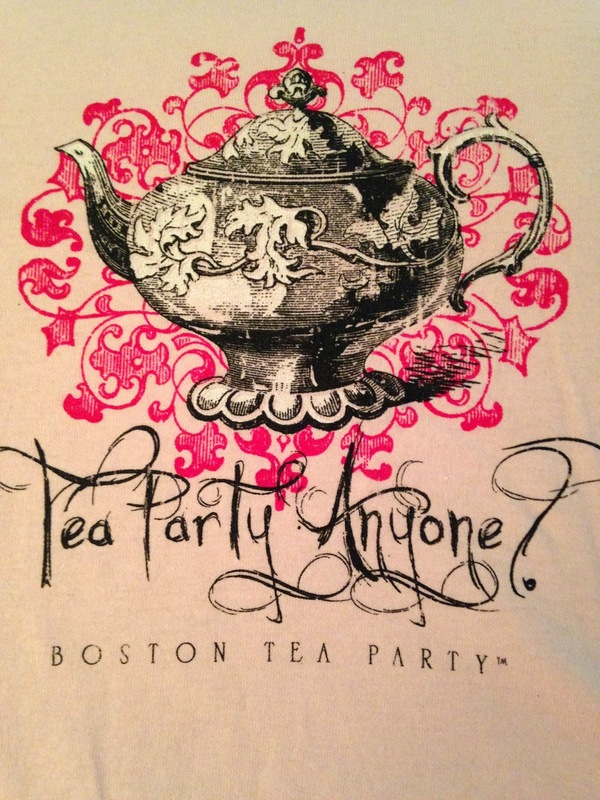 They have tea cozies, tea towels, little ships in bottles, reproductions of tea party newspapers, quill pens, colonial hats, and some very wry shirts. 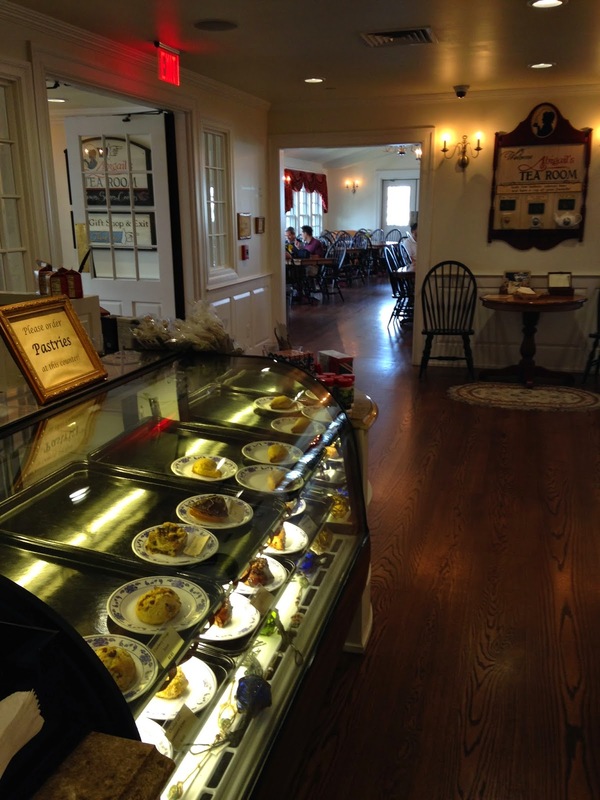 If you want to shake up your coffee break, or bring visitors to a place that they can't see anywhere else, I definitely recommend Abigail Adams Tea Room. It's the right kind of kitsch. Logistics: You don't need to pay museum admission if you're just going to have tea. The entrance to the museum is the gift shop. You walk through the shop, onto a walkway that goes up to the tea room. 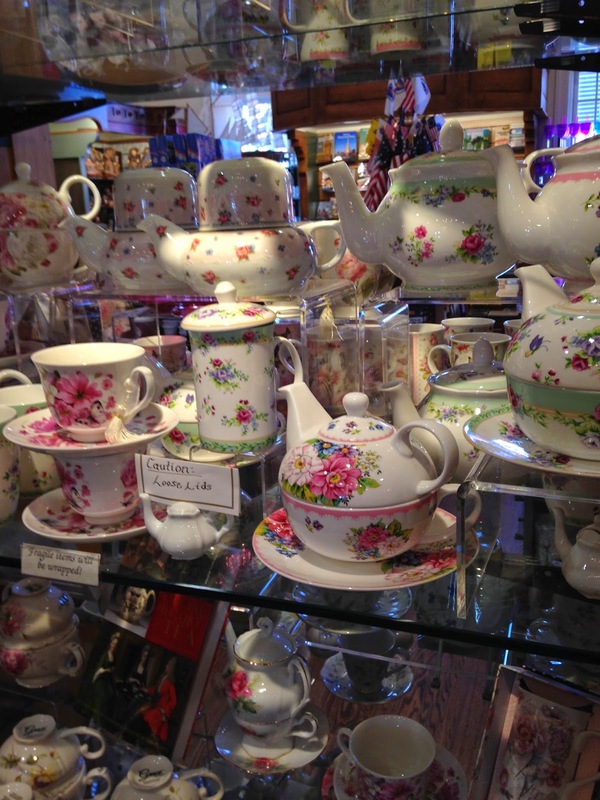 You may see old reviews online that show a set service of tea goodies, but these days, you buy things by the item at the tea room. There are many things that I hope for when I first look over a beach. 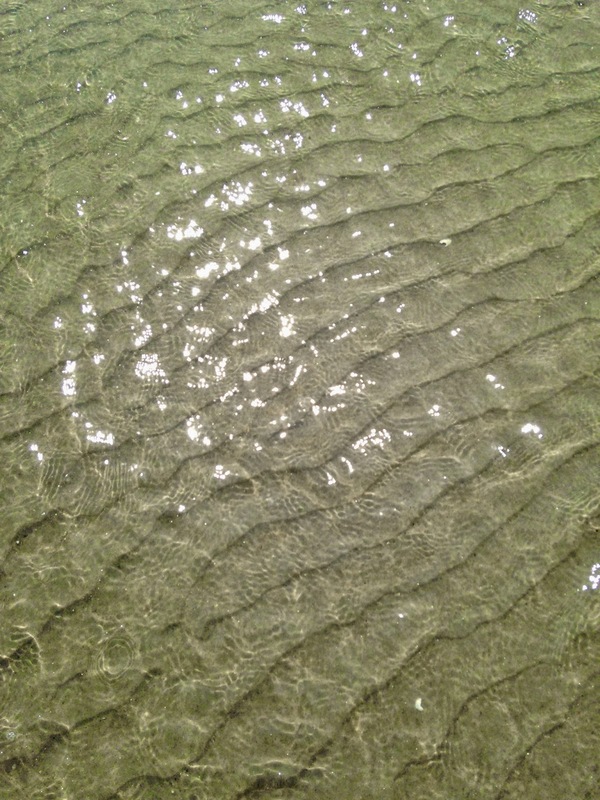 White sand, sunny skies, seagulls calling, waves gently crashing, blue water beckoning, a sense of calm and peace. Which is why, when I made it over the gentle sand slope up to Crane's beach and stood surveying the scene, I nearly had one of those cinematic moments where I drop to my knees, pull at my hair, and scream, "WHY, WHY,WHY?!!!!" Yes, the sight of hundreds of people packed in front of me almost induced hysteria. But I kept what little dignity I had, largely because I'd already read about the crowd at Crane's beach, and also the remedy. 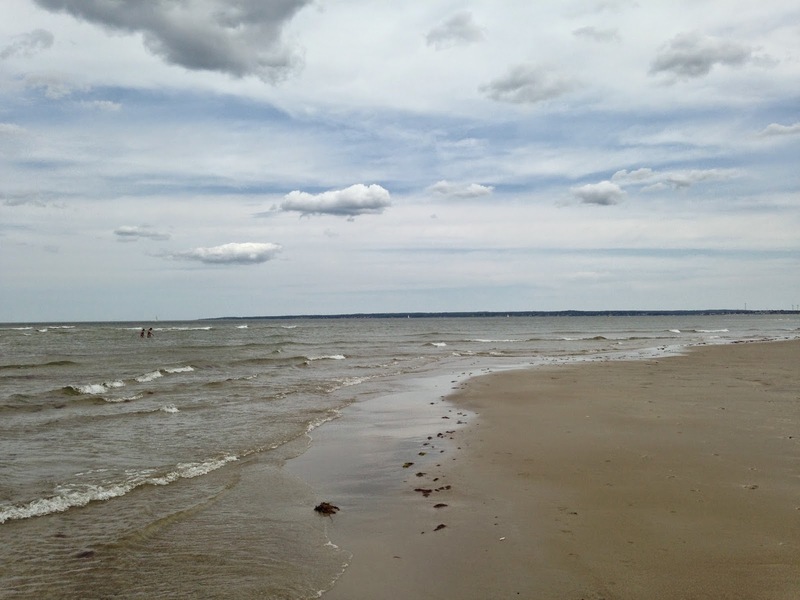 The beach is huge, like a few miles long, and if you turn right at the entrance, and walk for twenty minutes or so, you get away from the circus crowds, and are left with this. The downside is that there are no lifeguards once you get past the crowds, but I am not really an ocean swimmer. 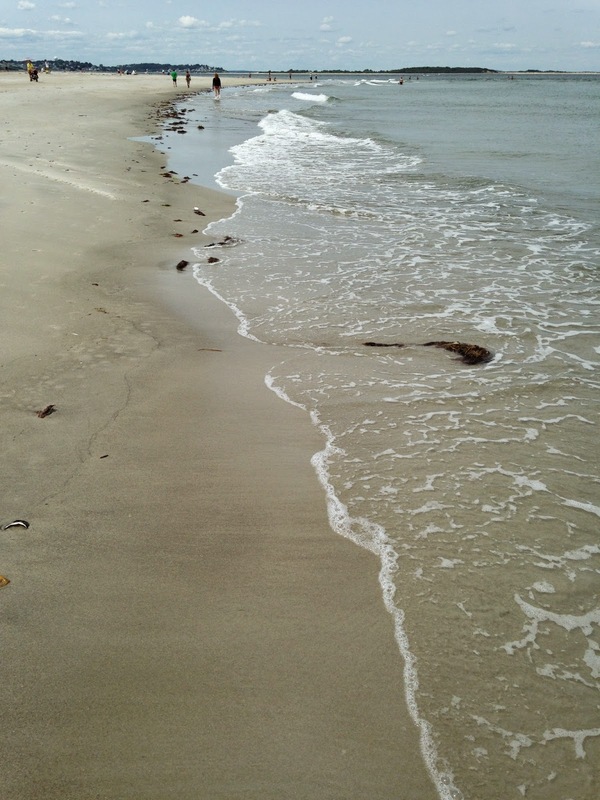 I like to sit on the sand and breathe in the calm, then dip my toes in the water, maybe go in as far as my knees, and then splash about like an elephant, pick up some pretty shells, and call it a day. 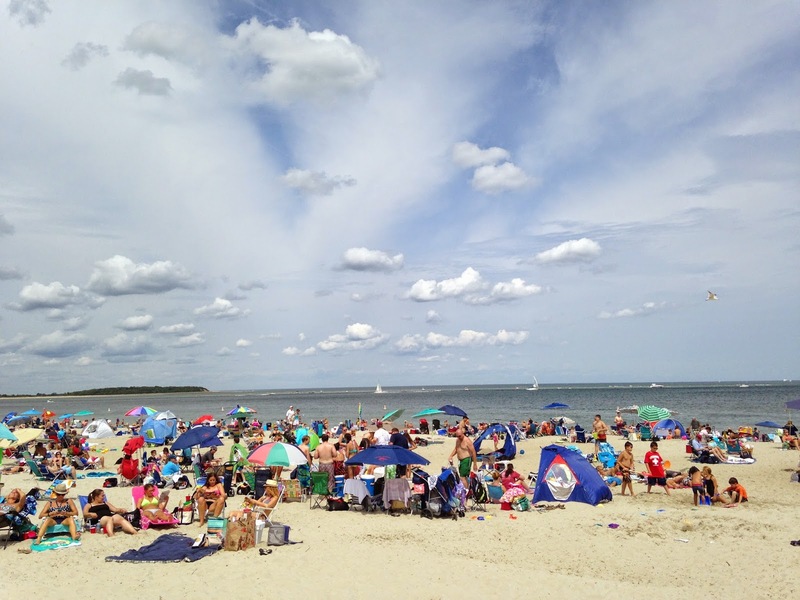 And I have to say, under those criteria, Crane beach was a hit. 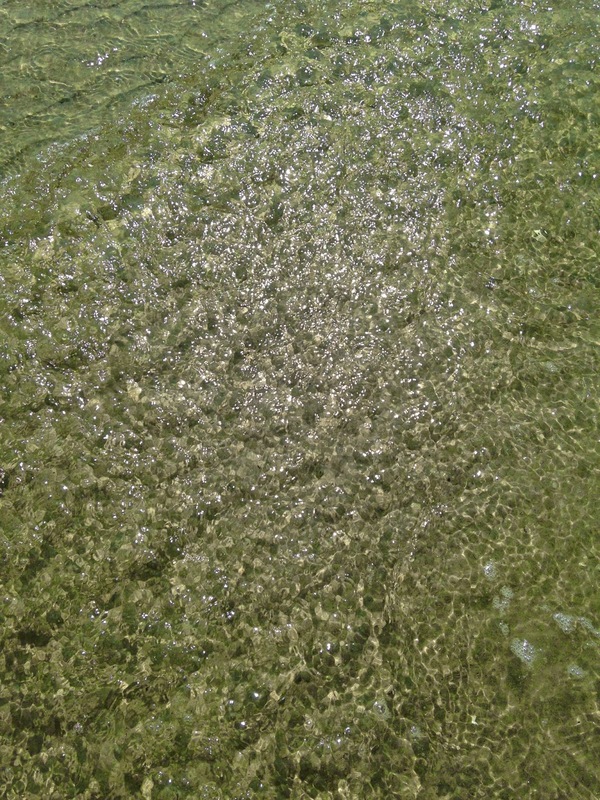 Among its other virtues, the sand sparkles. That's right, it sparkles. Whatever bits of shell and mineral wash up here, I noted as the water bubbled over my toes that I could see little bits of glitter swirling about me. Crane's beach alone would've been worth the time and effort to get there, but I had other fish to fry. 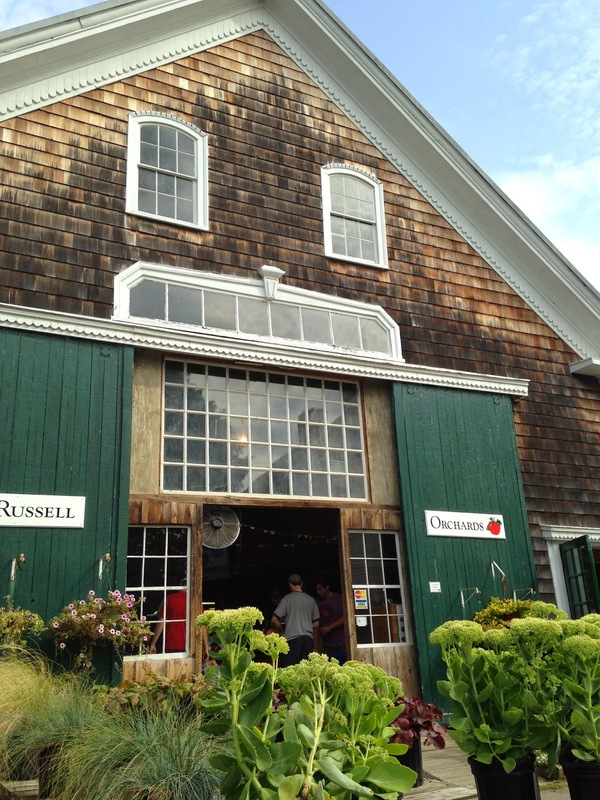 So I hopped on the bus (which was on schedule), and took the ten minute ride to Russell Orchards, a place where a city girl can have a little bit of a farmyard holiday and still make it back to the city before dinner. 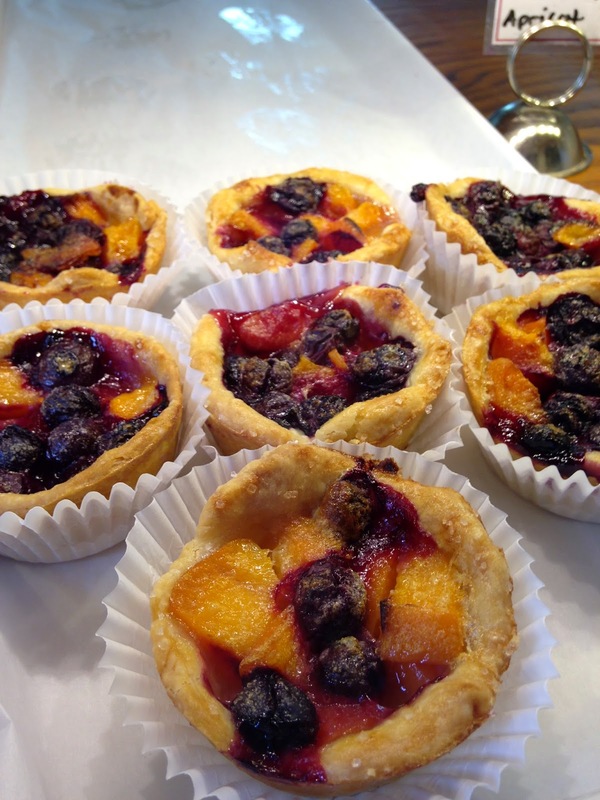 You will find a barn filled with an ice cream stand, a produce store, nick-nacks, wine tasting, and most importantly, a fully functioning bakery. 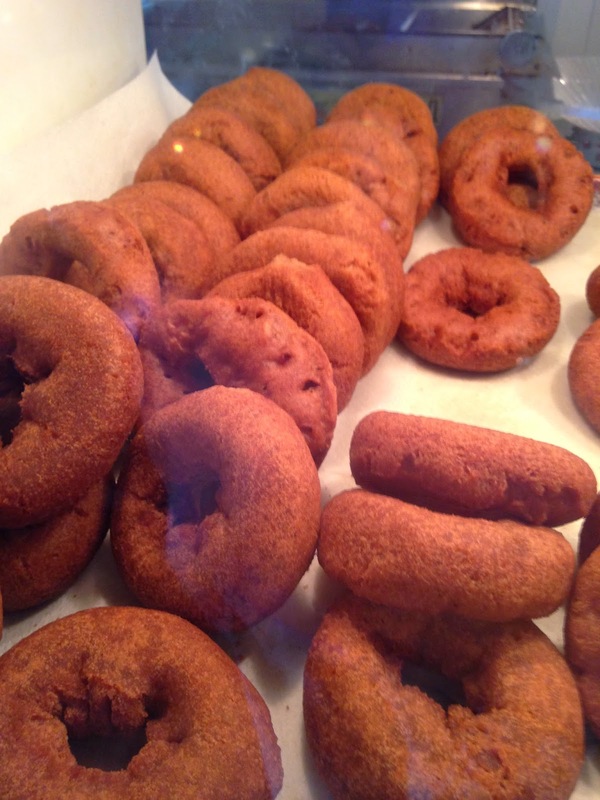 These folks make their own cider donuts, fresh. 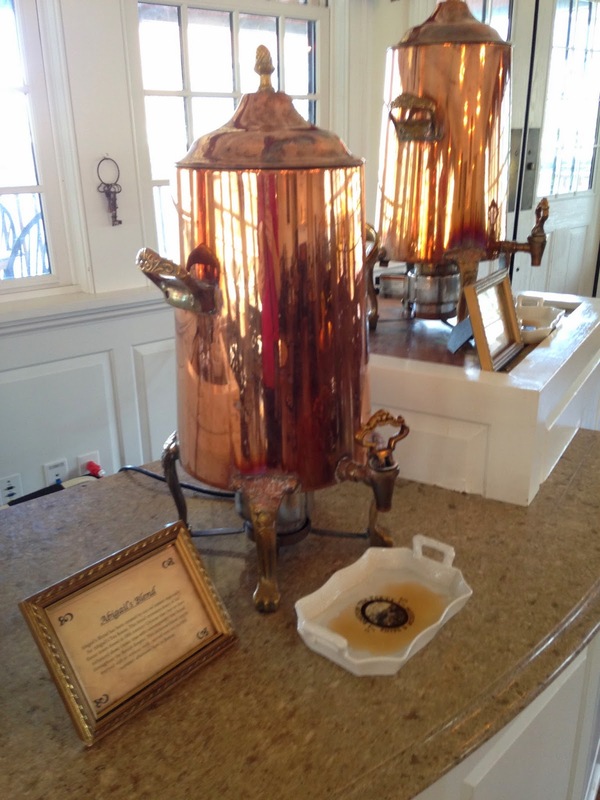 And they are in such demand that it is probable they will be straight out of the fryer when you buy yours. The same is true of their full size pies (blueberry, strawberry-rhubarb, and apple on the day I visited). When I picked up my hefty blueberry pie, it wasn't just warm on the bottom, it was HOT...as in, just came out of the oven, HOT. And that was in the afternoon. So as far as I can tell, the farm is basically cooking up a storm all day, and the goodies are flying out the barn just as rapidly. I'll grant you, it was summer and it was a weekend, but I have a feeling that apple-picking season is no less joyous and busy on the farm. That said, let me point out that waiting for you outside the barn is...nature. 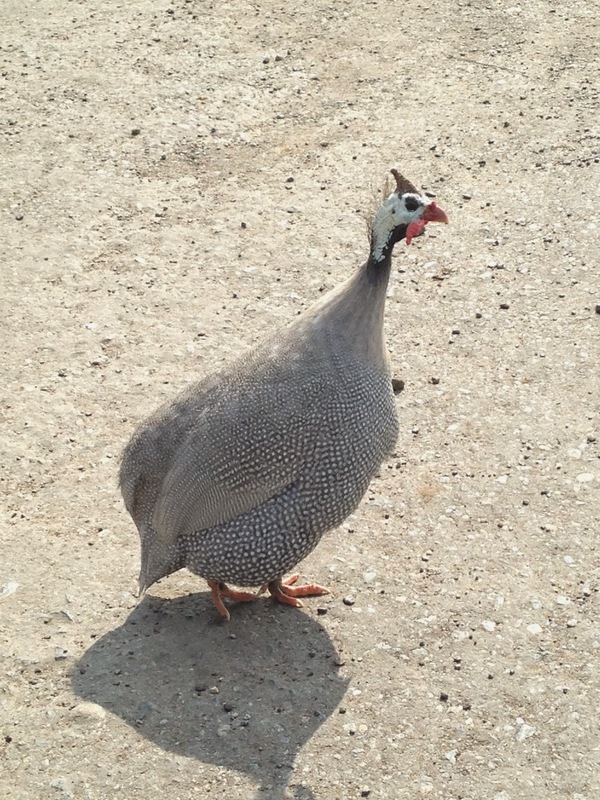 I wandered off to the blueberry patch to pick my own carton of blueberries in my flip flops and was not only followed by a very strange looking pack of fowl (turkey?) but soon noted the preponderance of biting flies, wasps, ants, etc. It belatedly occurred to me that this is why they sell bug spray in the store. Pretty pond with ducks and chickens. Pretty apple tree. 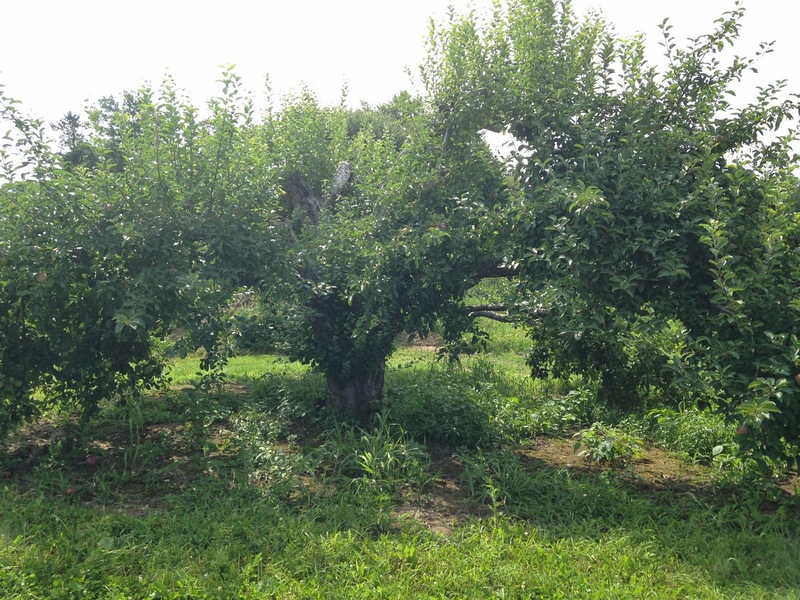 Picking season isn't until September for apples. 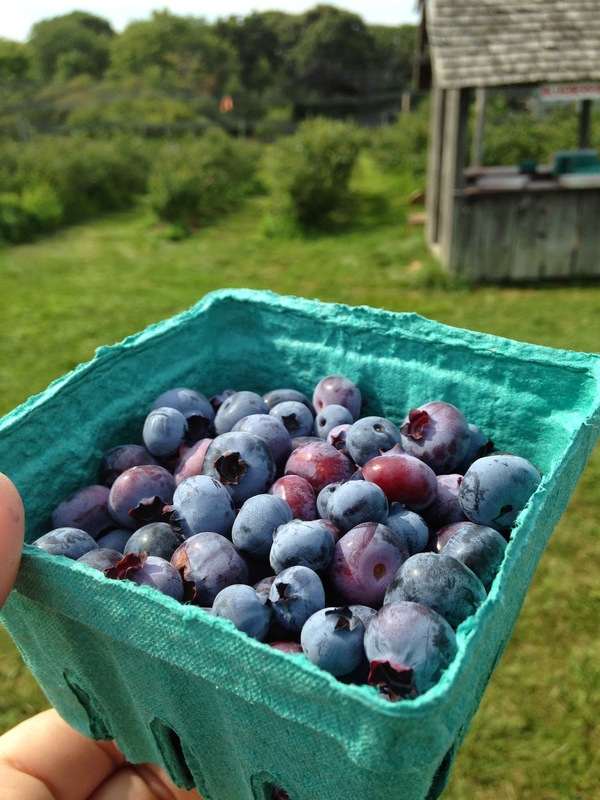 It also occurred to me as I saw the body of a long-deceased birdy being eaten by wasps (stuck in the netting above the blueberries), that possibly there was a reason some people were just buying the cartons of blueberries in the barn store, rather than coming out to pick their own. After that, a stinging fly went for my foot, and I started to imagine that every little tickle on my legs were ticks and ants...and yes, I hot-footed it back to the store. 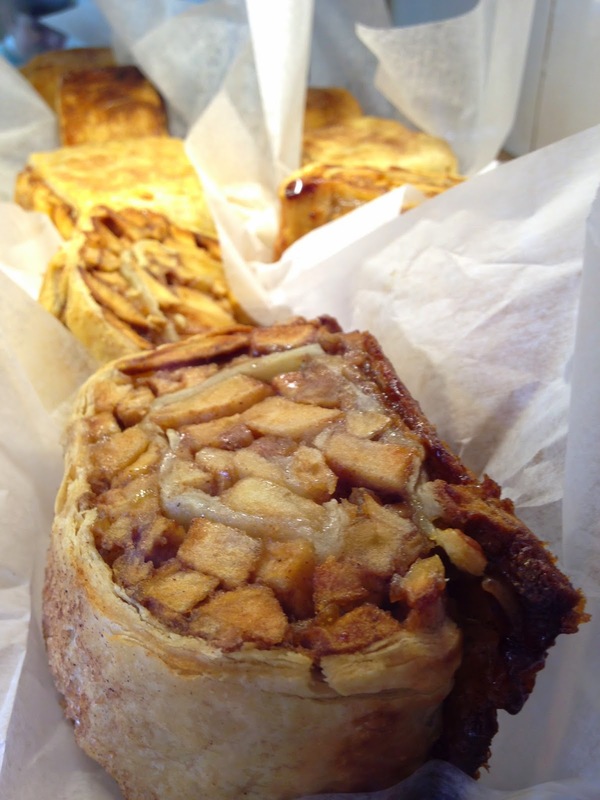 Now, you are probably wondering, how does the barn bakery stack up on taste and value? Well, the cider donuts were hot, crispy, and mildly flavored. I inhaled one at the speed of light, and noted people walking out with ten and twelve at a time. Personally, I expected more of a cider flavor, but the aroma was heavenly and I certainly wouldn't say no to another helping. The scone was not too dense and had a nice flavor of rhubarb, the goat cheese and vegetable pocket was quite tasty, and the little peach-berry tartlet was a tender bite. But now to the hard part: the blueberry pie. 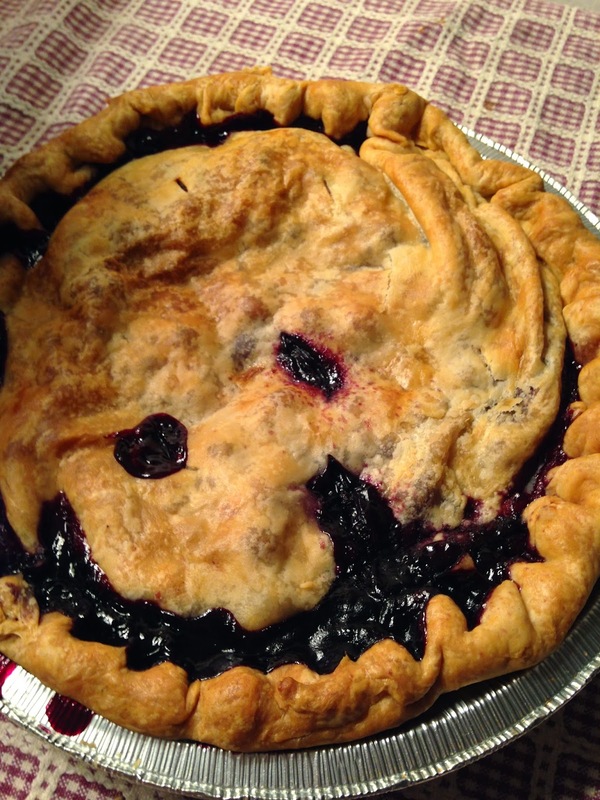 It looked as it ought to look when I cut into it, a flaky golden crust with a juicy interior of wild blueberries and jellied goo of the Gods (well, how else do you describe a good pie filling!) It had even bubbled up a little over the crust, which is always a good sign. My foodie buddy and I were alight with anticipation as we lifted our forks. And....well, what can I say, there was not a lot of flavor. It tasted like they forgot the salt, the berry flavor was extremely mild, and the crust was...not bad, but not wonderful either. It is the first and only time I've ever had to get up and fetch the salt shaker in order to feel that a pie tasted right...and we even snuck in a squirt of fresh lime juice to give it a little more flavor. It was not that the pie was an abomination...but it was not the level of excellence that I would expect from a farm bakery that specializes in pie. That said, I believe the visit to the orchard and the purchasing of goodies is, in and of itself, so unique and fulfilling an experience that you should absolutely go. 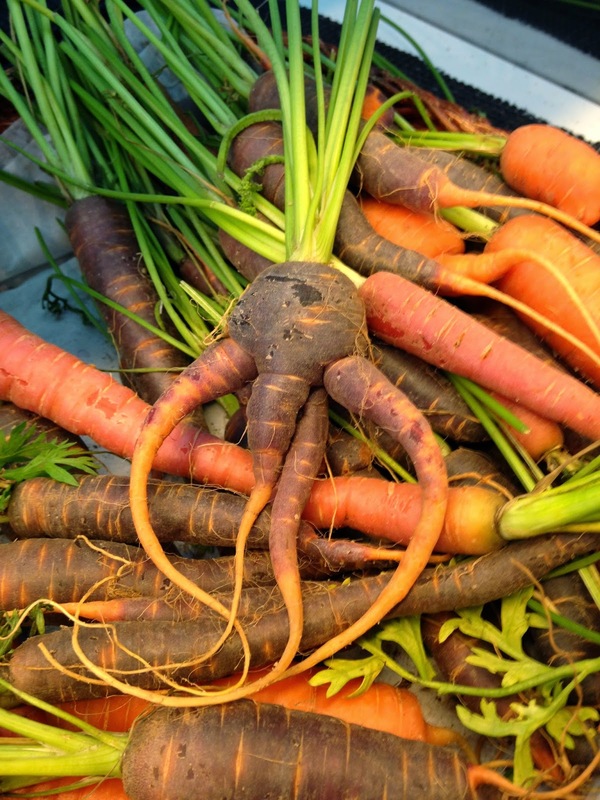 The mysterious octopus carrot. I dared not buy it! For those on a budget, please note that the store is by no means inexpensive. Most of their pies are $20. And when I went up to the counter with this canvas tote bag, I nearly spittled up a lung when the lady informed me it was $40. 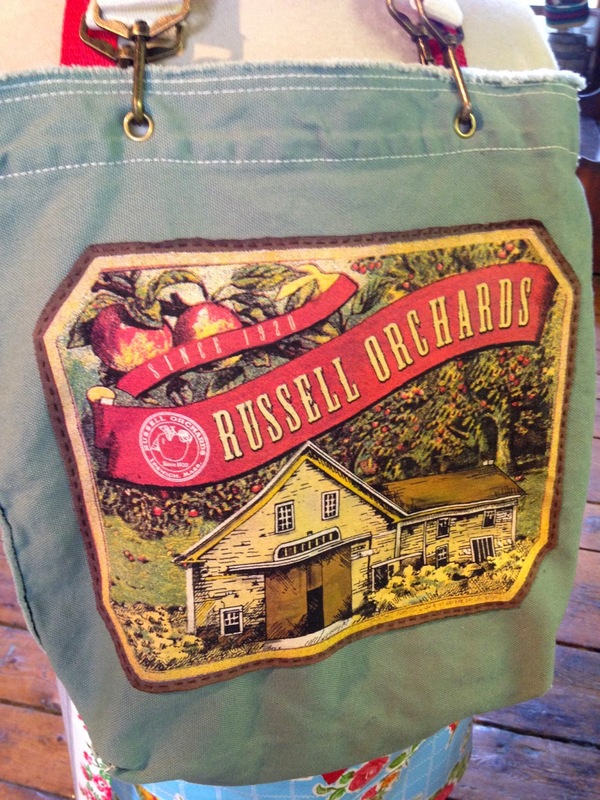 So don't go expecting dirt-road apple-stand prices. Logistics: It's $18.25 for a round trip from North Station to Ipswich (on the Newburyport/Rockport line). When you get off the train in Ipswich (a 40-minute train ride), the Ipswich Essex Explorer bus will be waiting right at the train station. 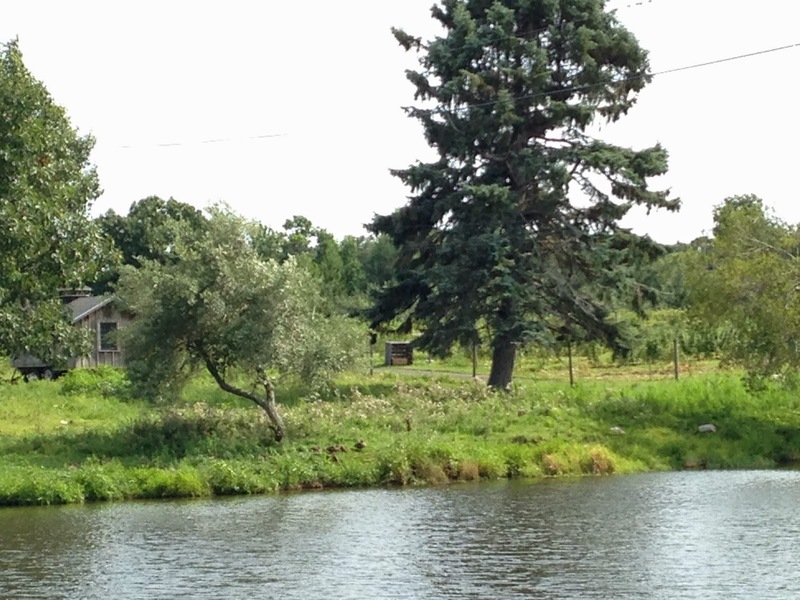 For $5, you can hop on/off its route to Crane Beach, Russell Orchards, Wolf Hollow, and the Ipswich visitor center. Note: the Ipswich Explorer bus can't give change, so be sure you have exactly $5 on you. It's a ten minute ride to the orchard, and another ten after that to the beach. 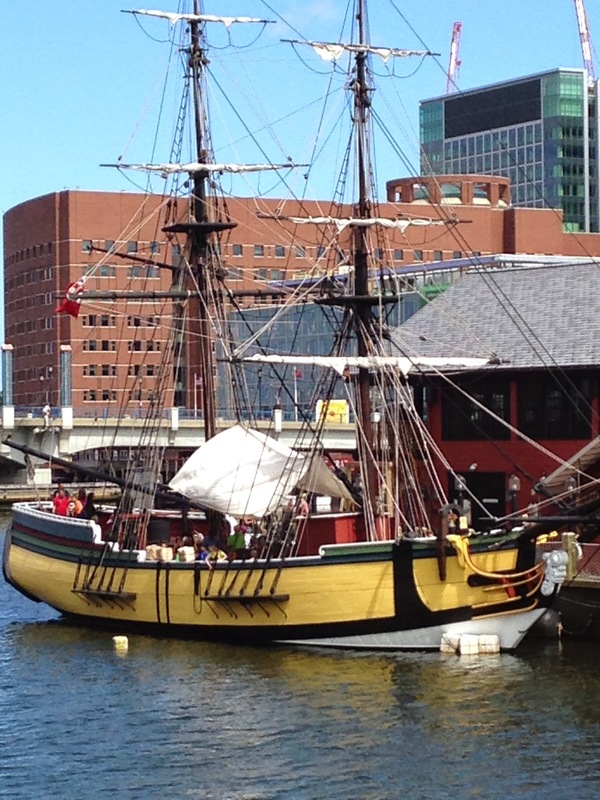 A very doable day trip from Boston for someone who doesn't have a car. 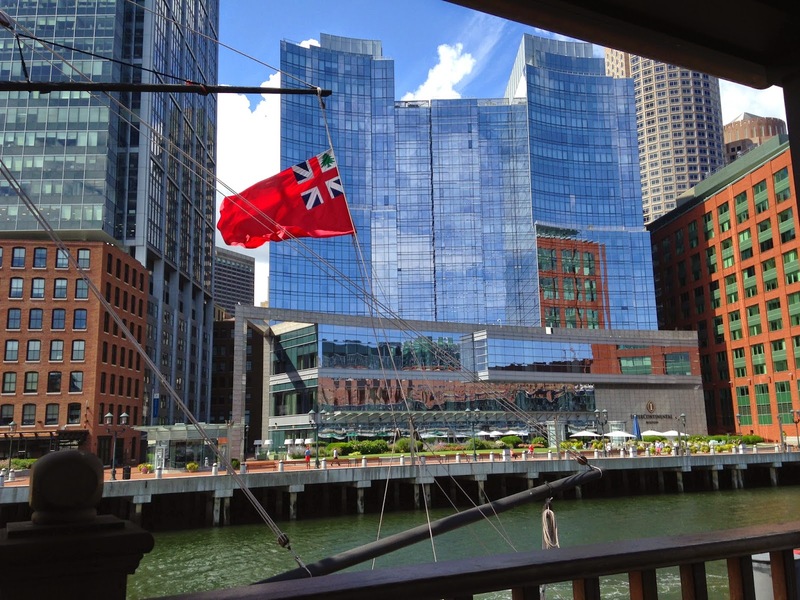 IMPORTANT: The Ipswich Explorer only runs in the summer and only on weekends, so check their schedule before you go. 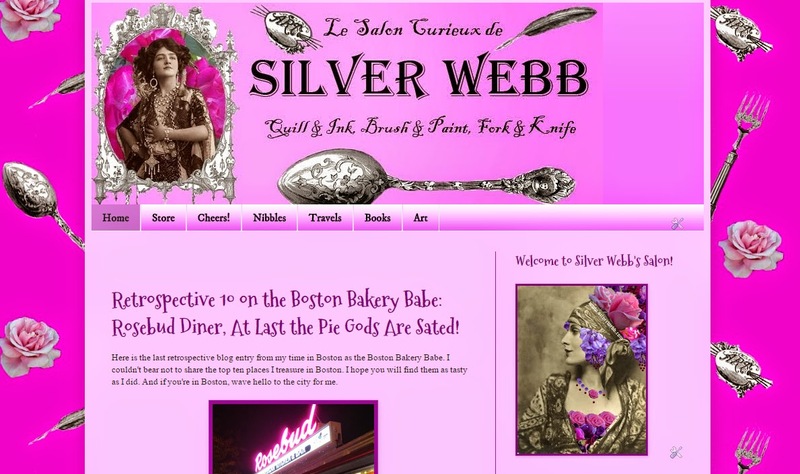 I am now blogging at SilverWebb.com! Follow the Boston Bakery Babe by Email! Become a Bakery Babe Fan! 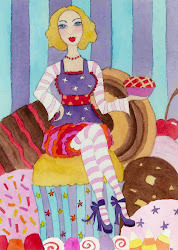 All words, photographs, and paintings copyright the Bakery Babe. Simple theme. Powered by Blogger.